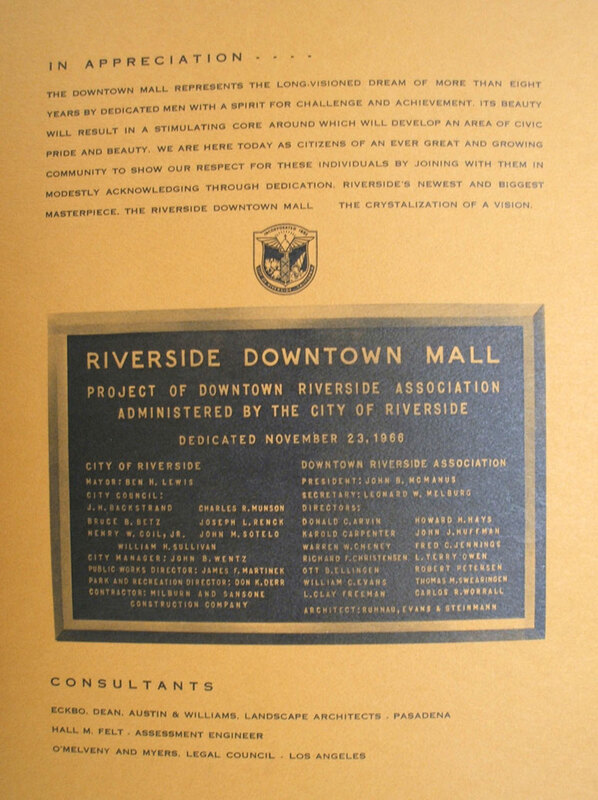 Following the 1957 opening of the Riverside Plaza mall, downtown shopping began a slow but steady decline. 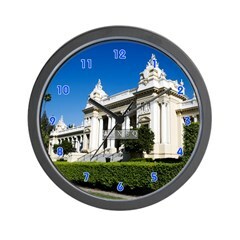 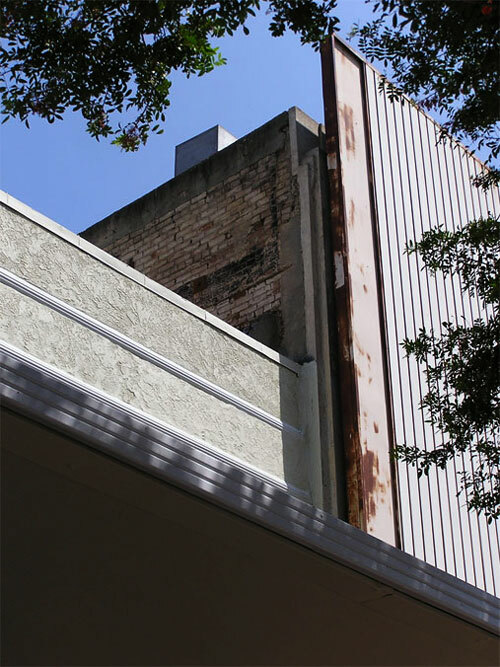 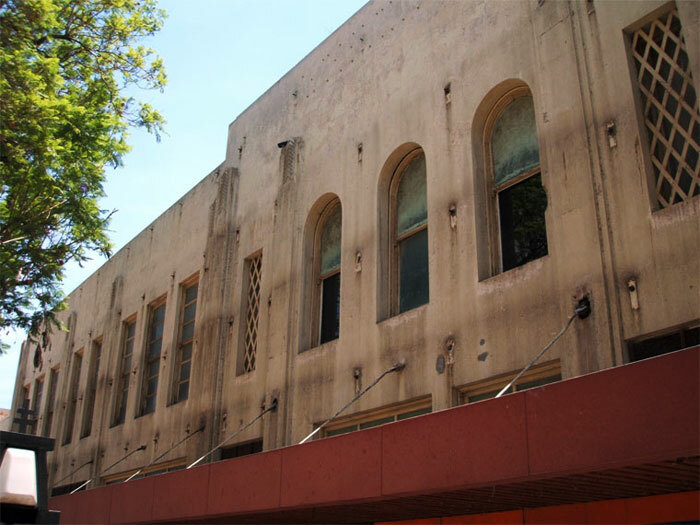 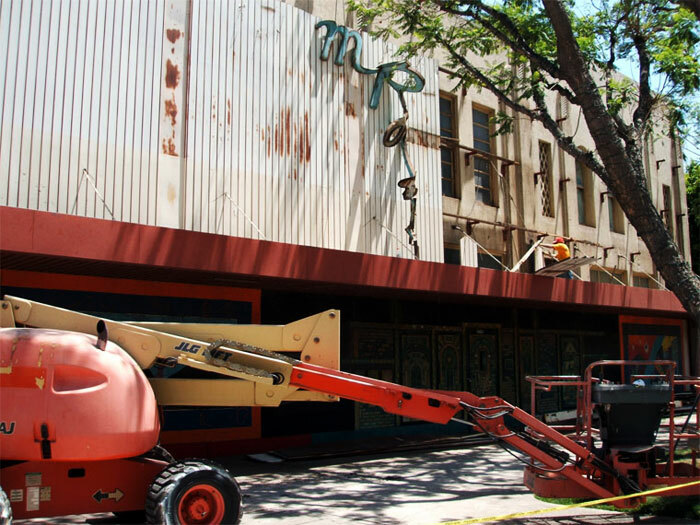 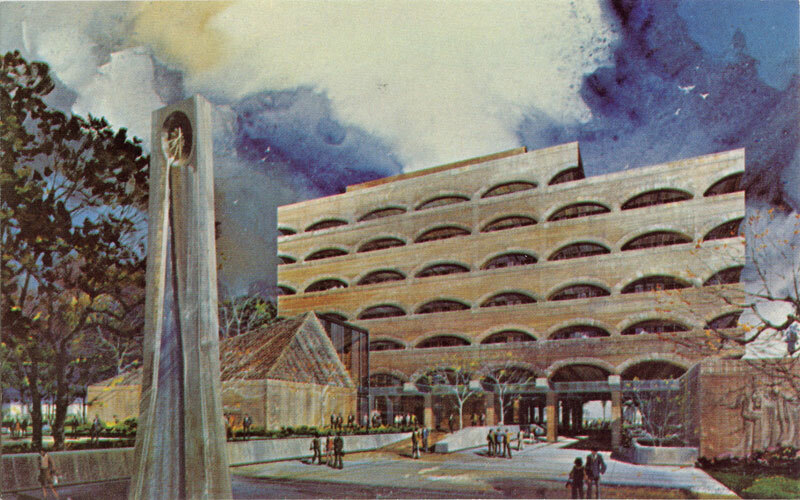 In response, city leaders quickly began working at remaking the city’s civic center. 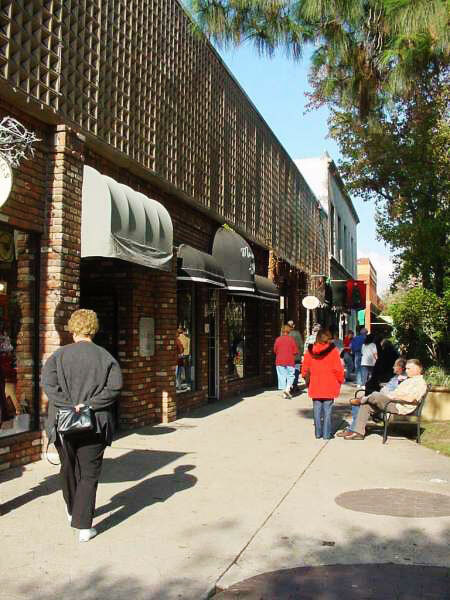 Discussions took place regarding additional parking, modernized storefronts, and streetscape improvements. 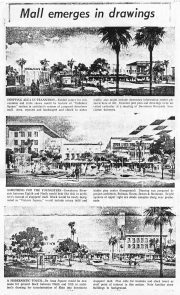 In June 1958, Los Angeles architectural firm Welton-Beckett & Associates presented a downtown master plan covering several city blocks. 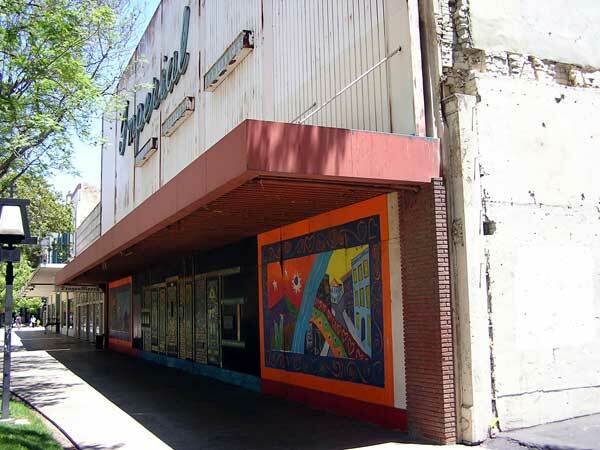 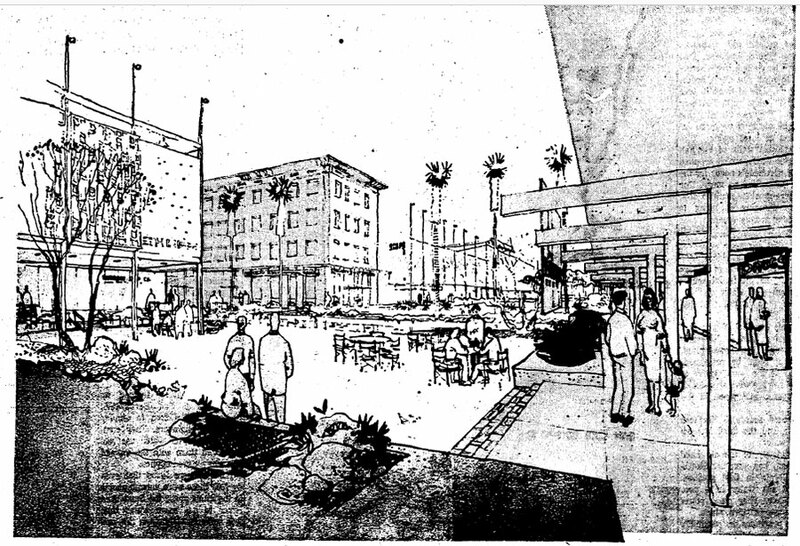 Envisioned in the plan was a pedestrian mall along Main Street from Seventh to Twelfth streets. 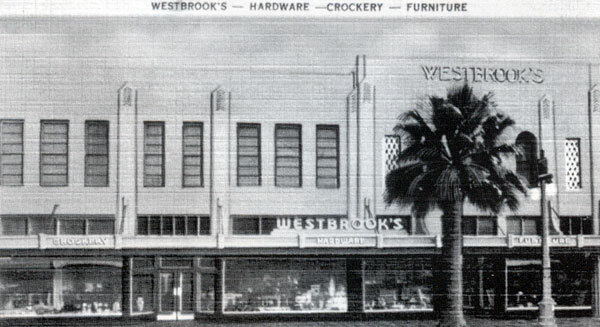 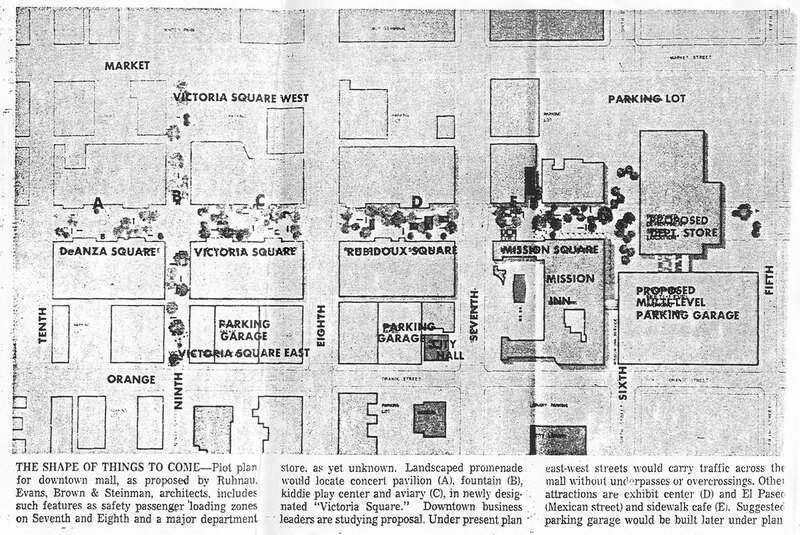 Although Welton-Beckett’s full master plan was eventually rejected, elements provided the impetus for a similar, yet smaller, pedestrian mall between Sixth and Tenth streets. 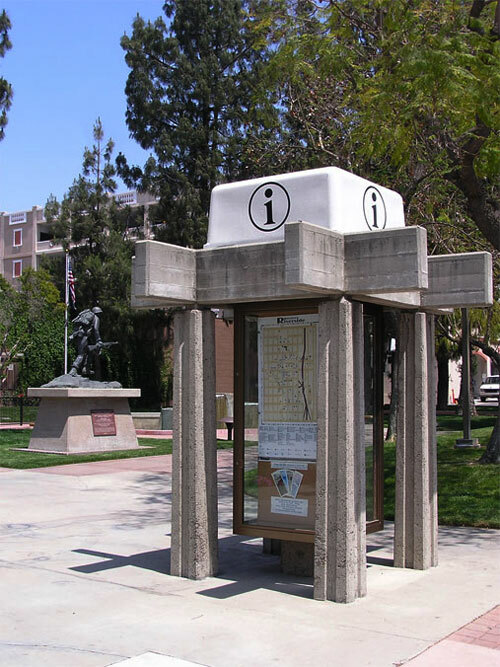 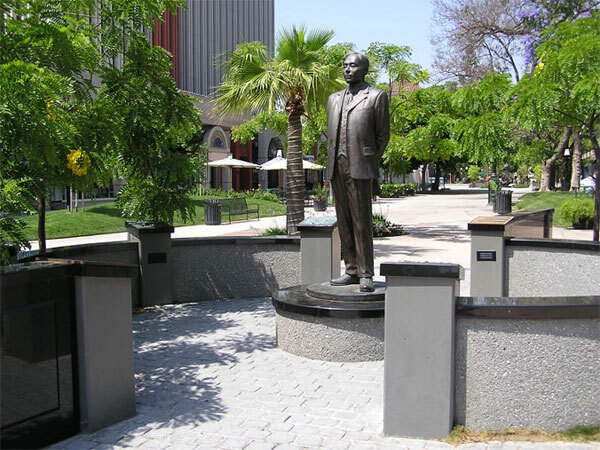 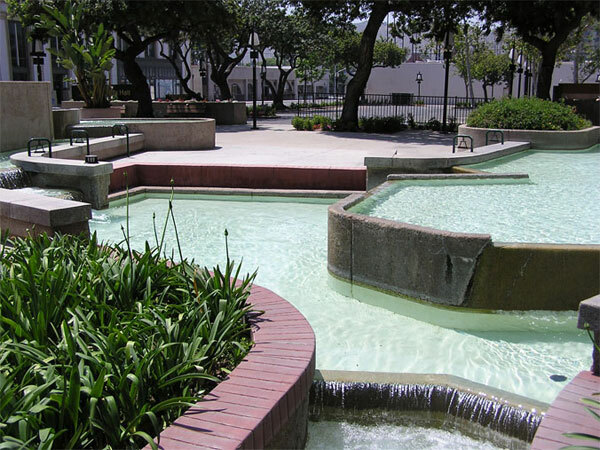 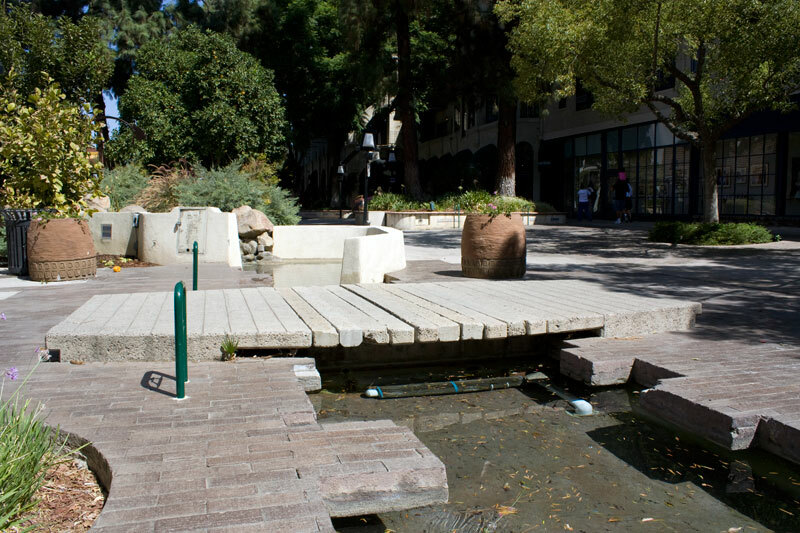 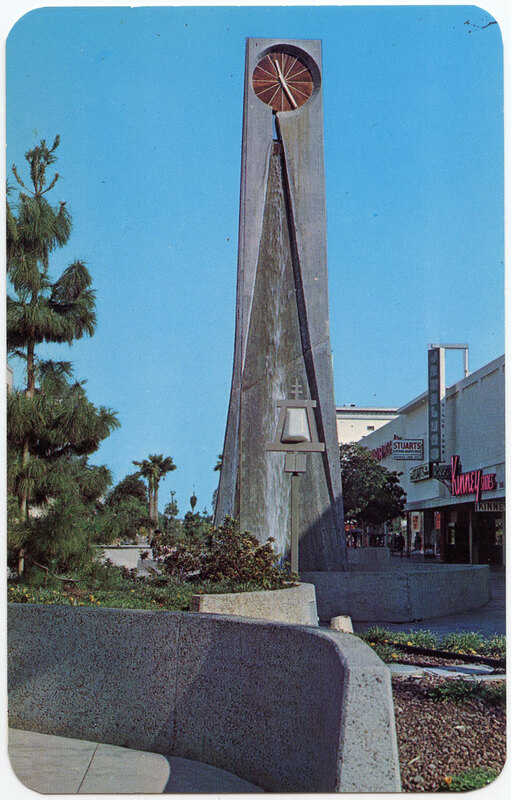 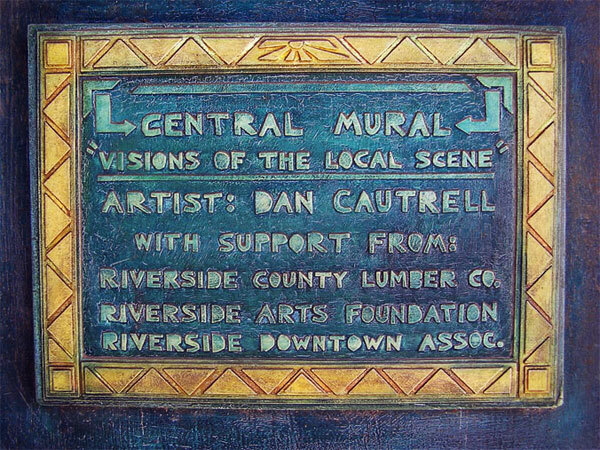 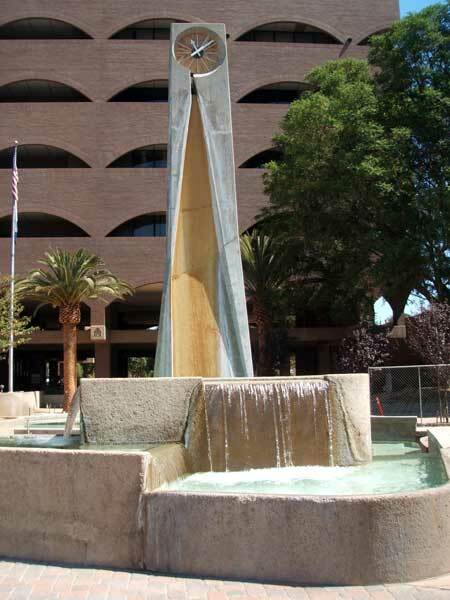 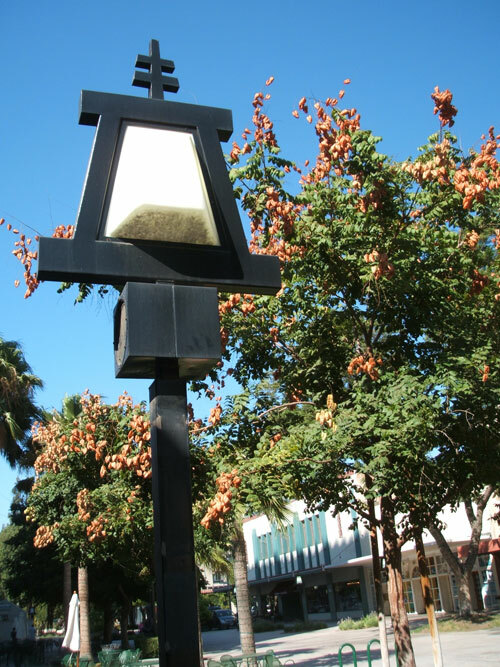 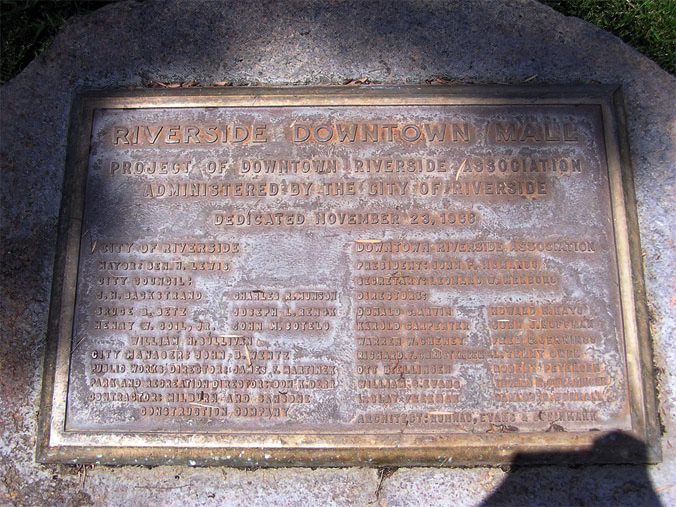 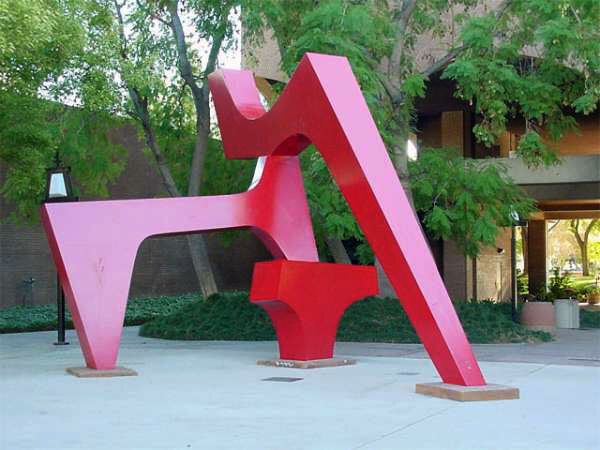 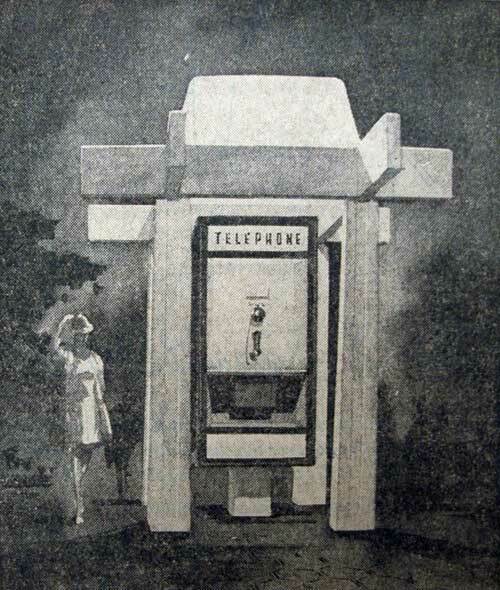 Unveiled in September 1963, this second version was designed by Riverside architectural firm of Ruhnau, Evans & Steinmann, with landscape planning from Eckbo, Dean, Austin & Williams of Pasadena. 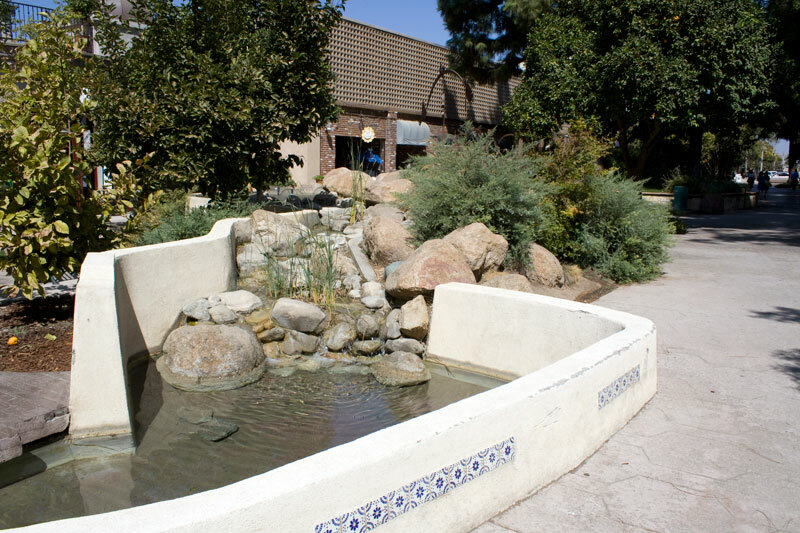 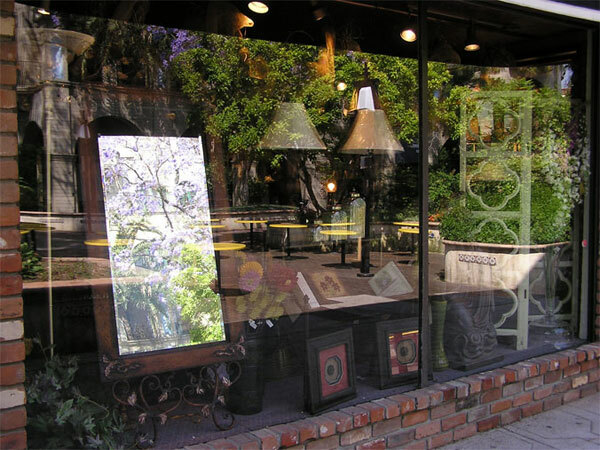 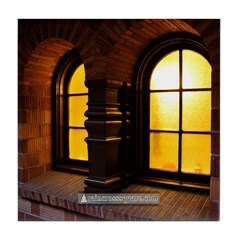 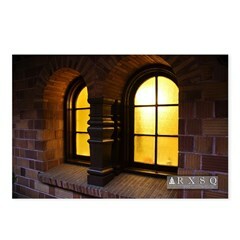 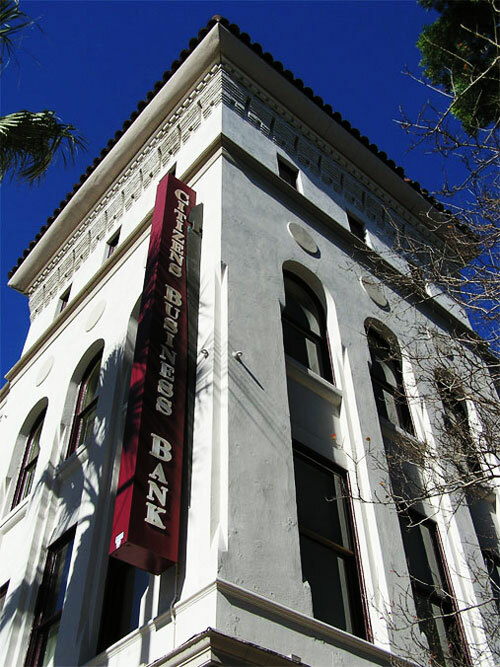 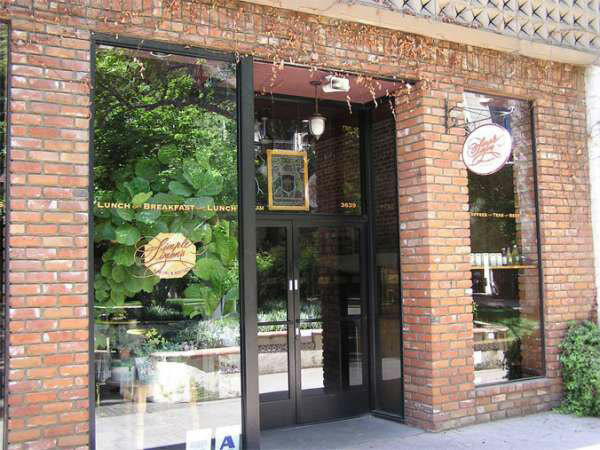 General contractor for the project was Milburn & Sansone of Riverside. 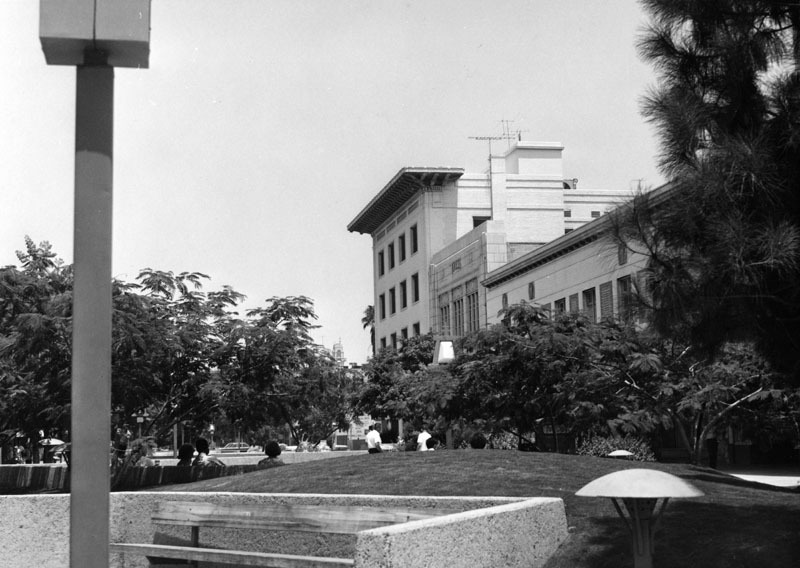 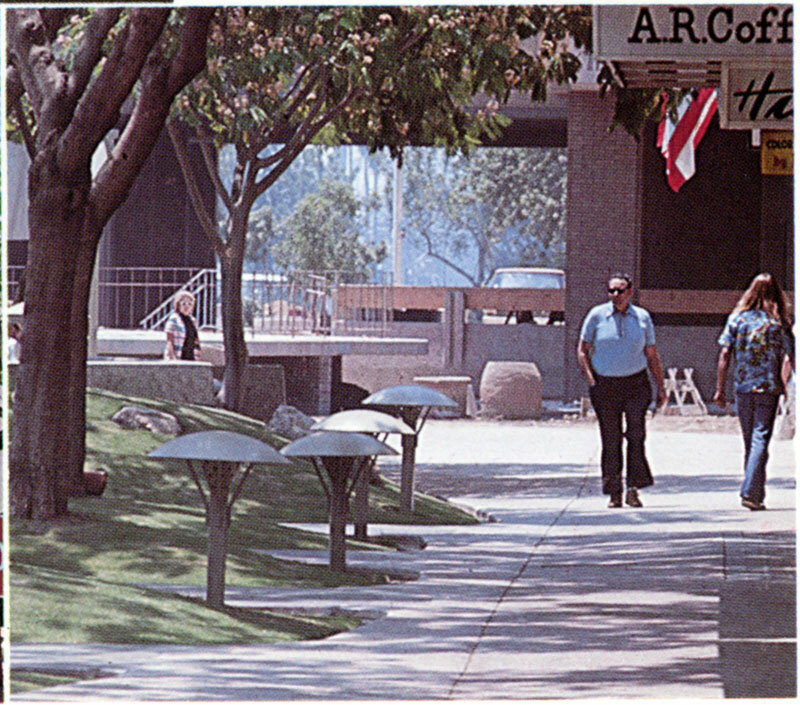 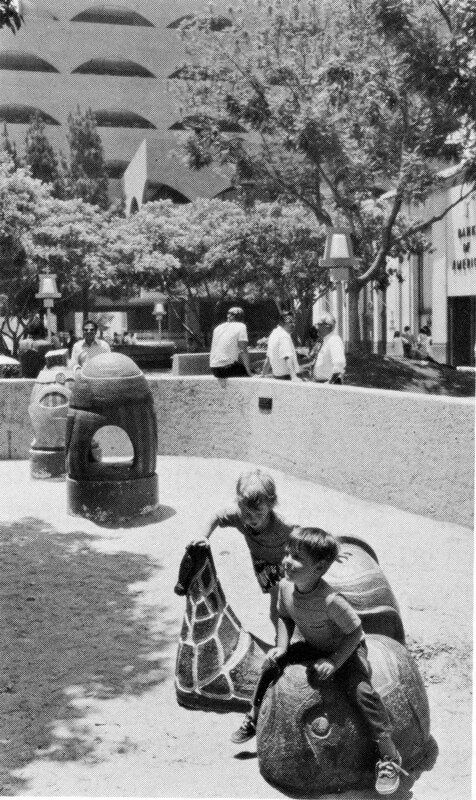 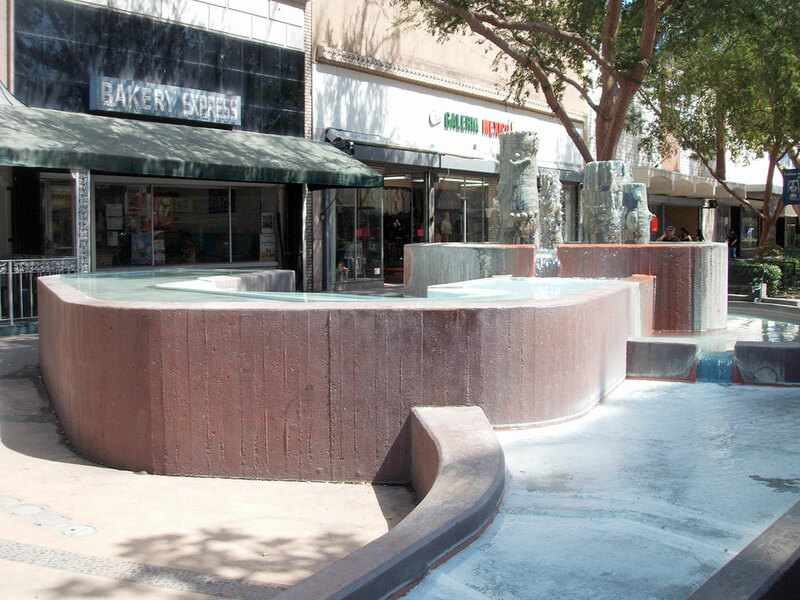 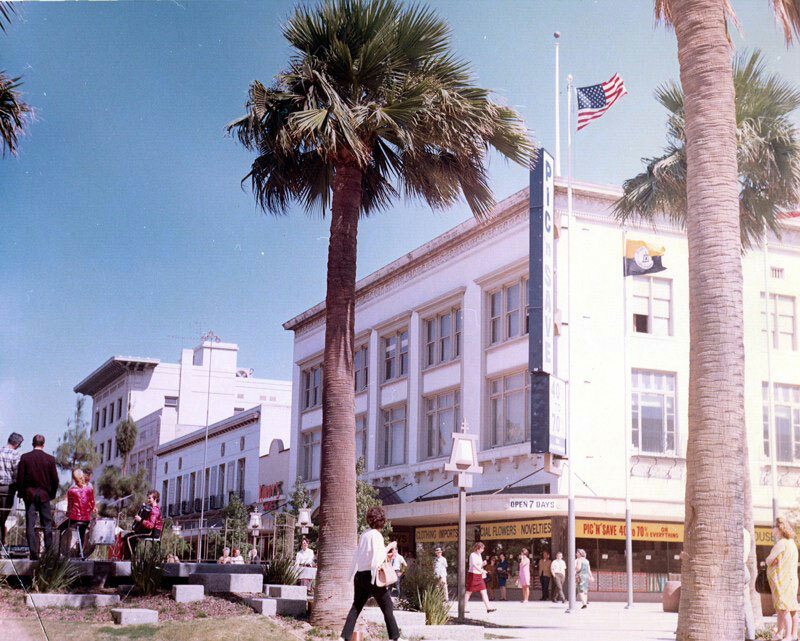 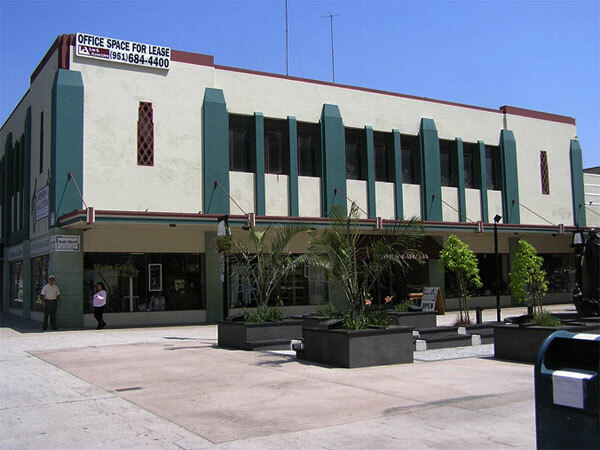 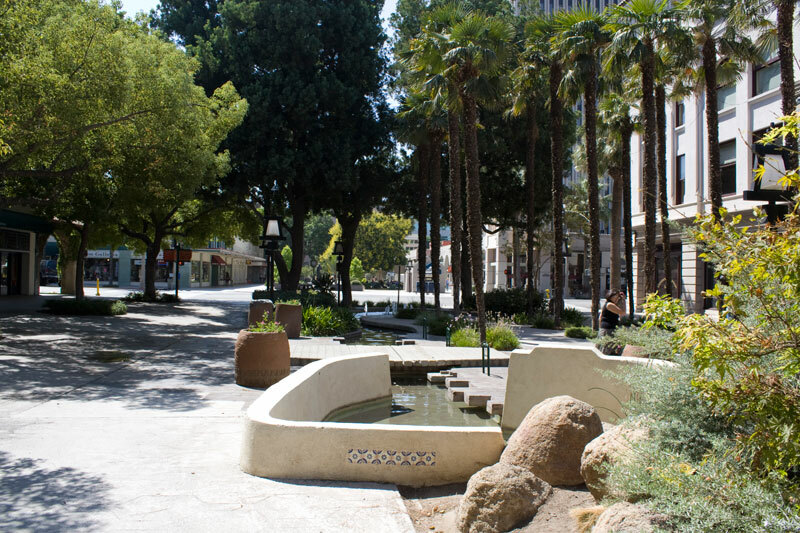 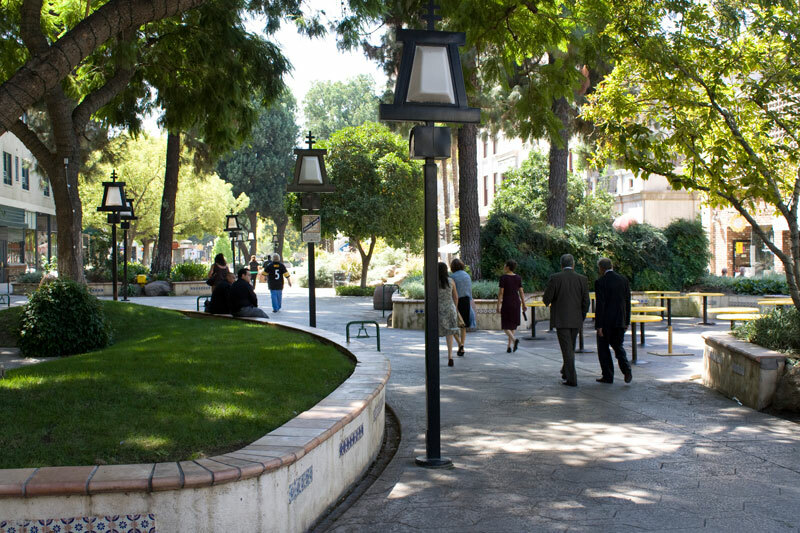 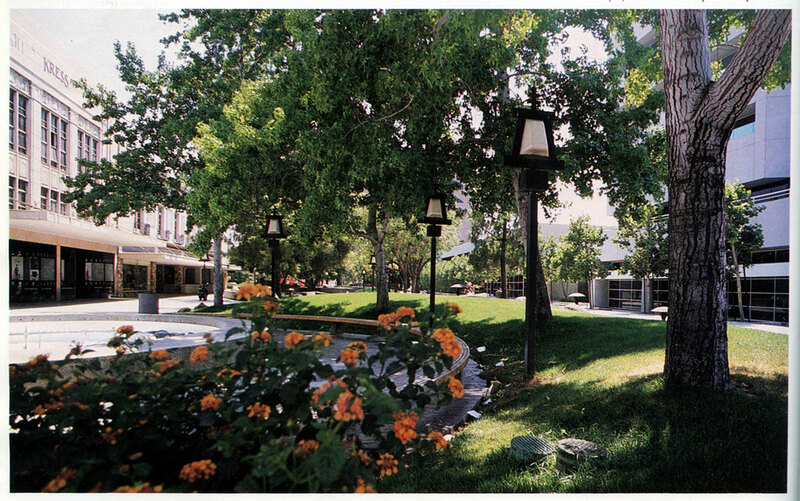 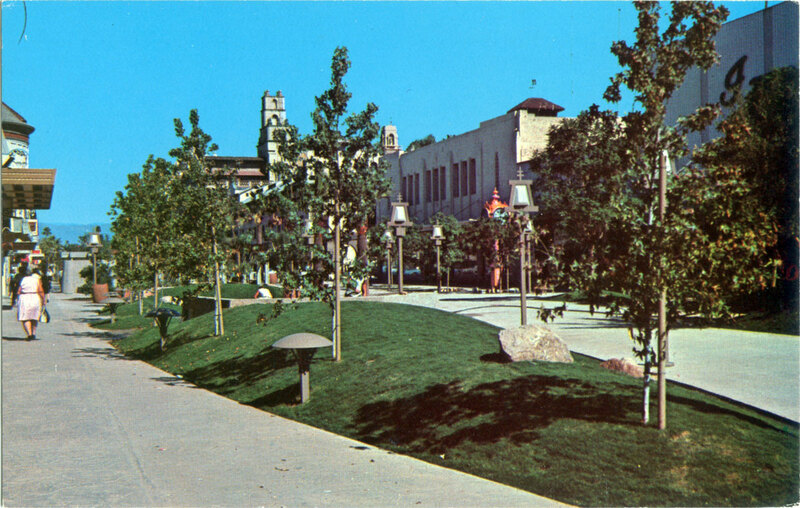 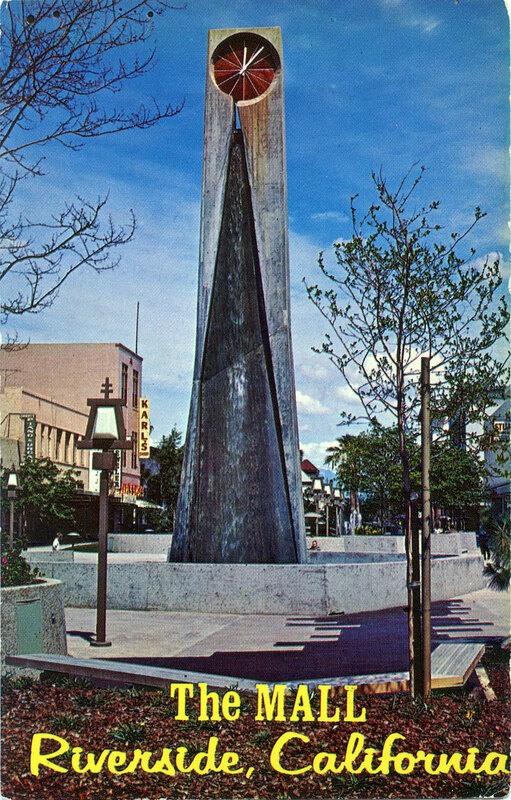 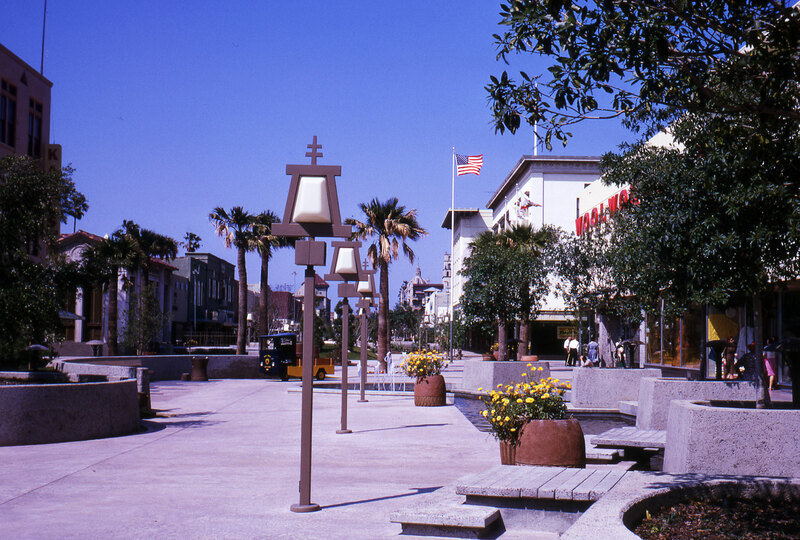 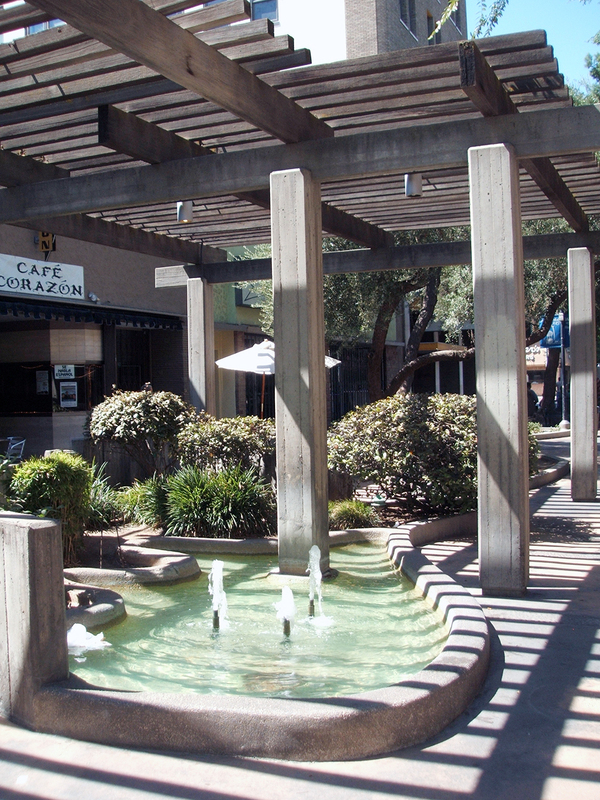 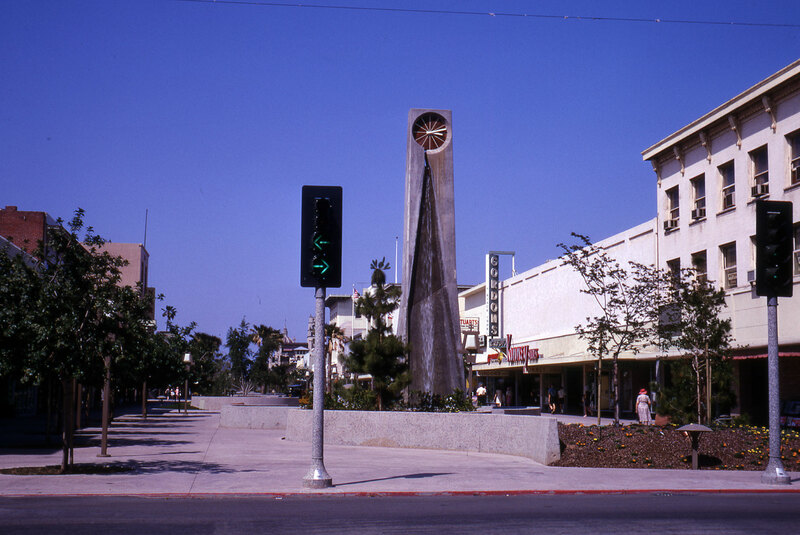 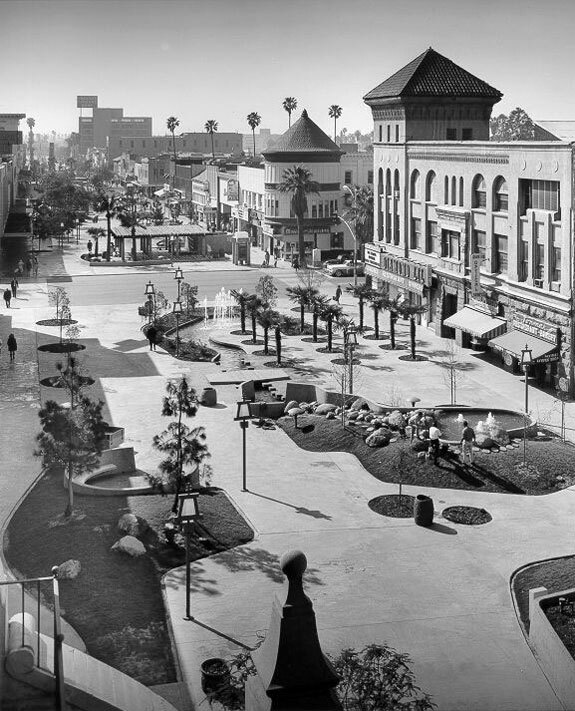 Both the Eckbo and Milburn firms had also worked on Fresno, California’s “Fulton Mall” (1964), which partly explains the Eckbo-esque landscaping similarities between the original Riverside (one | two | three | four) and Fresno (one | two | three | four) pedestrian malls, of which some elements remain. 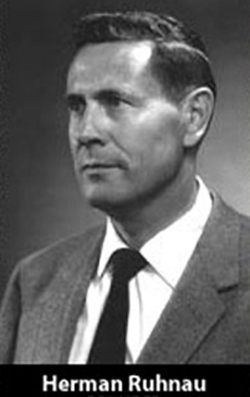 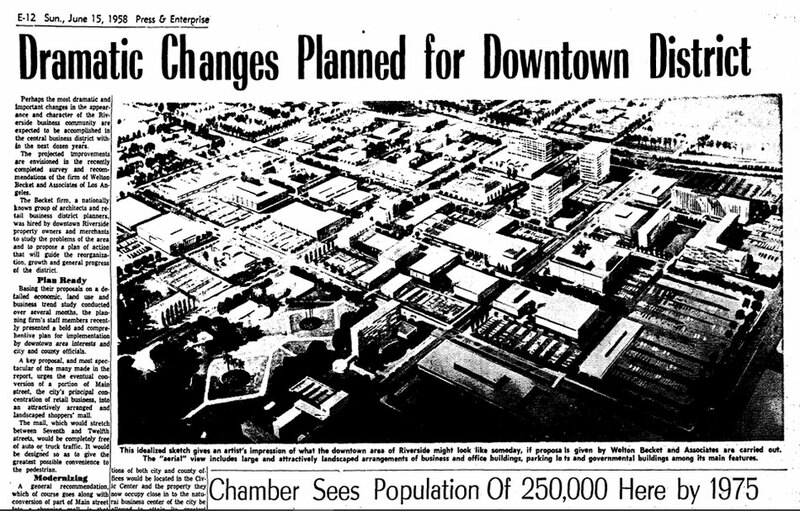 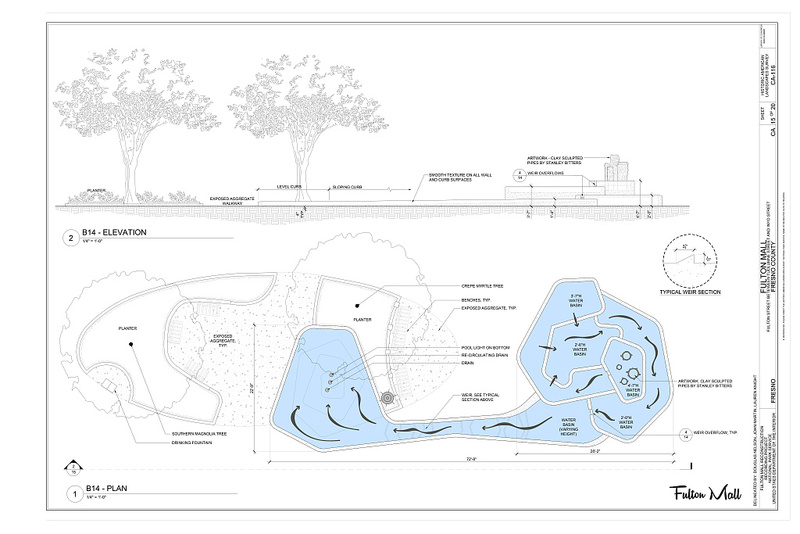 In late 1965, the city settled upon a revised version of Ruhnau’s 1963 plan. 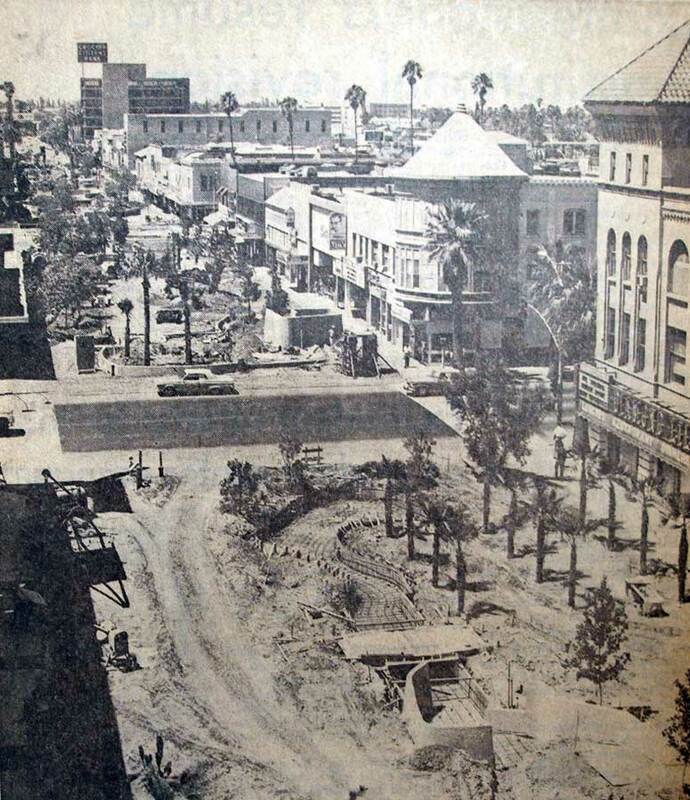 As a result, work tearing out Main Street began in May of 1966. 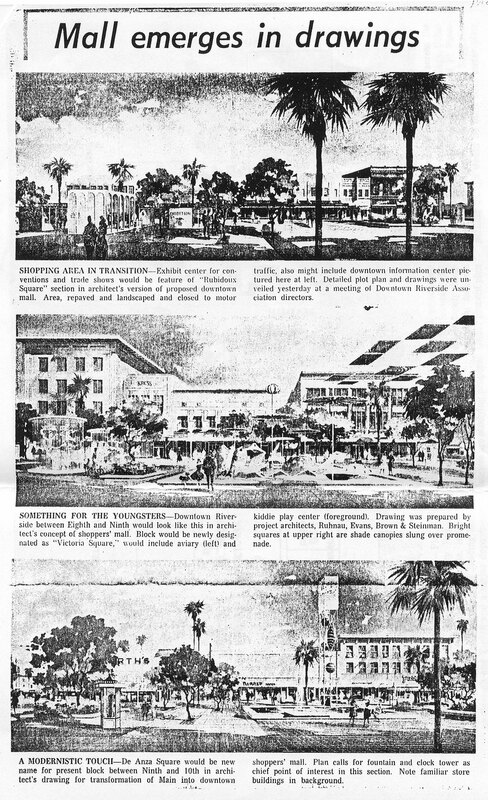 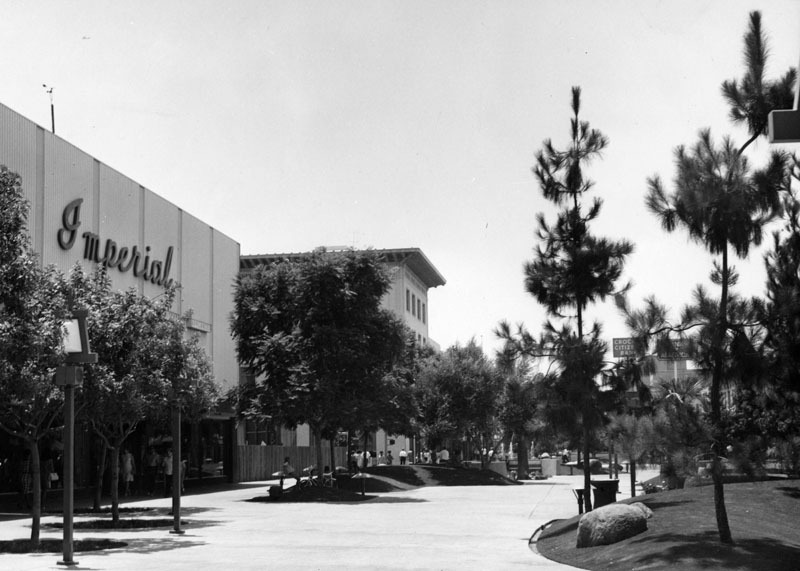 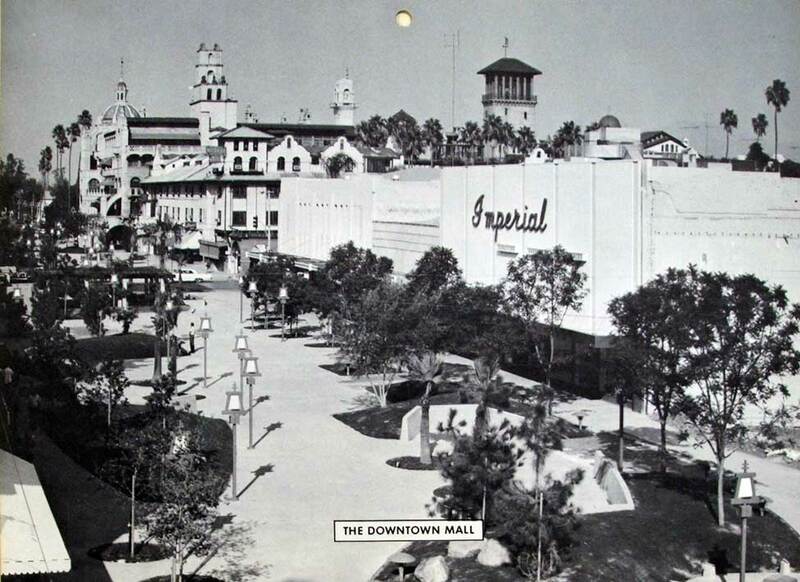 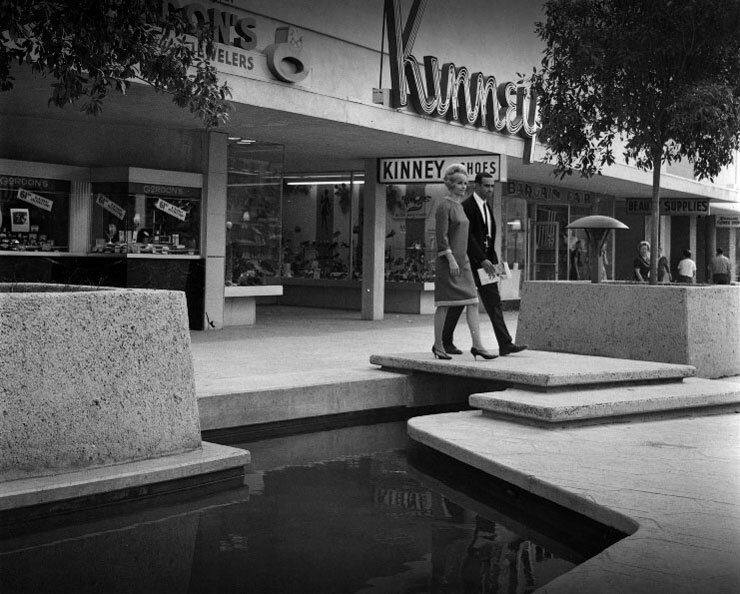 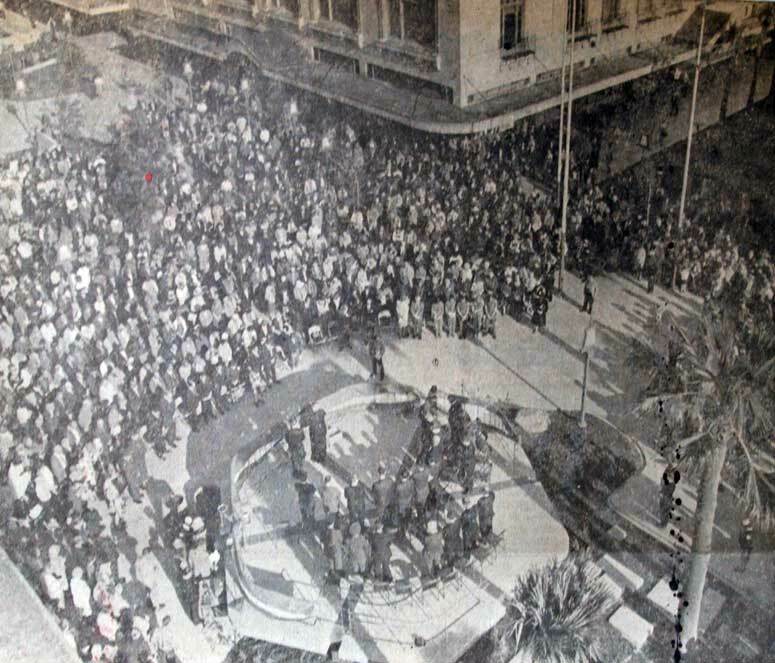 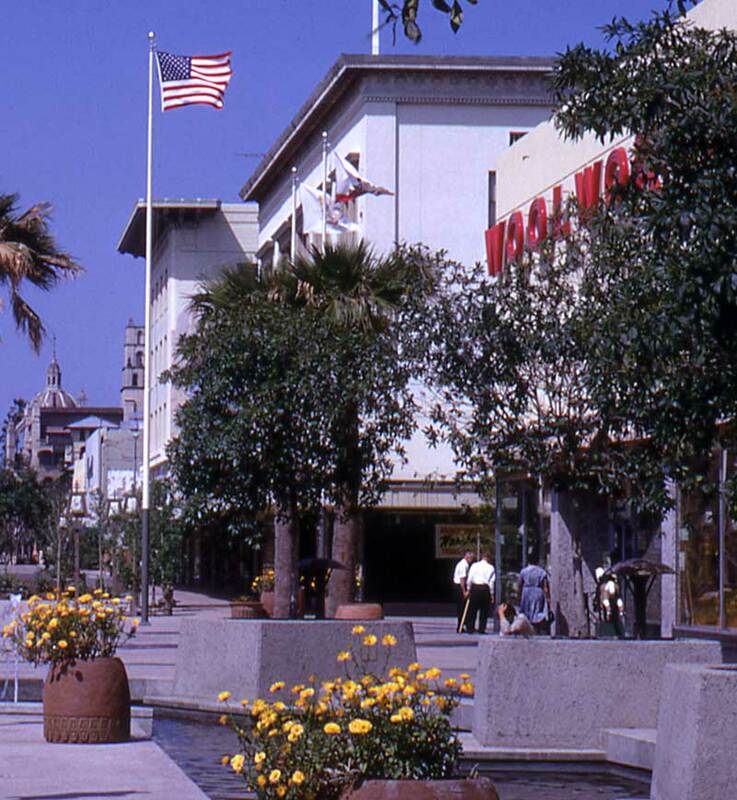 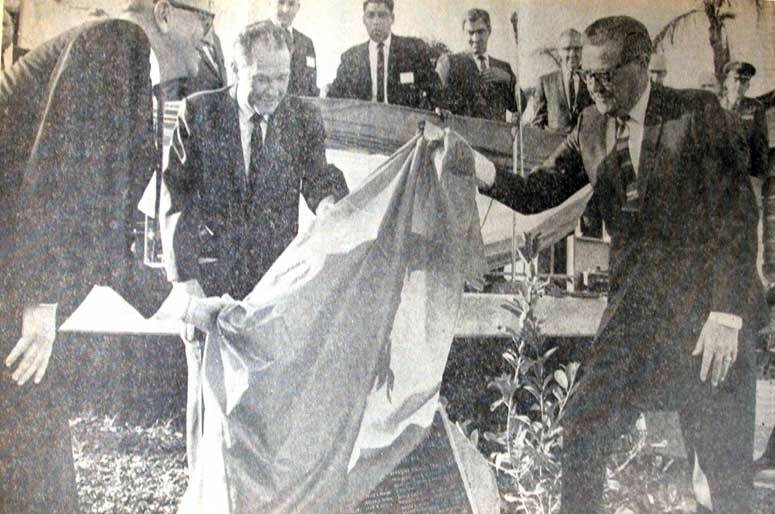 And on November 23, 1966, the newly-landscaped (and auto free) mall was officially dedicated. 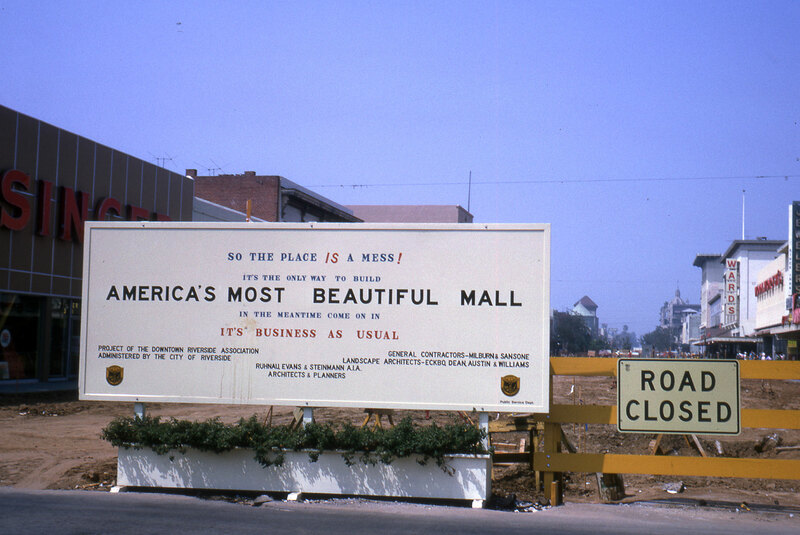 A single bisecting east-west street – Ninth – was closed off at the new mall. 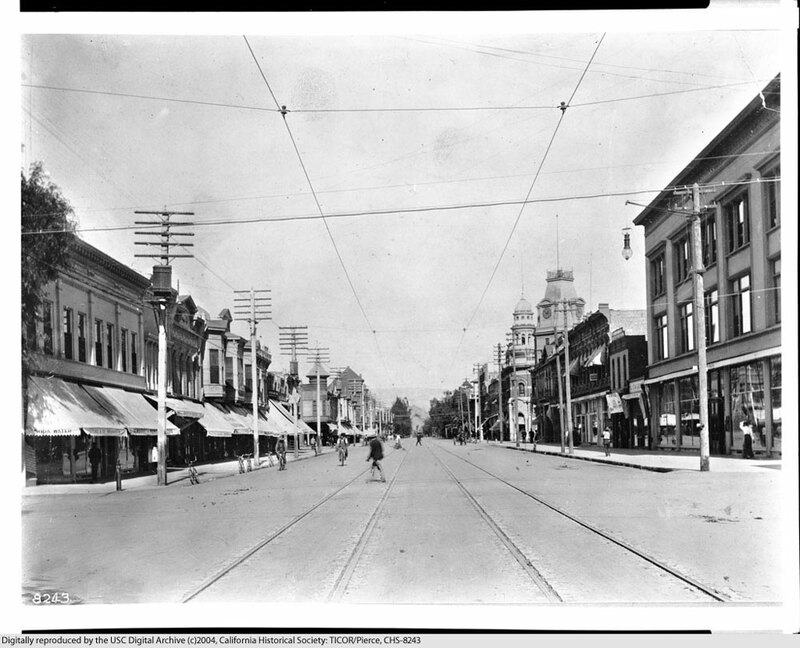 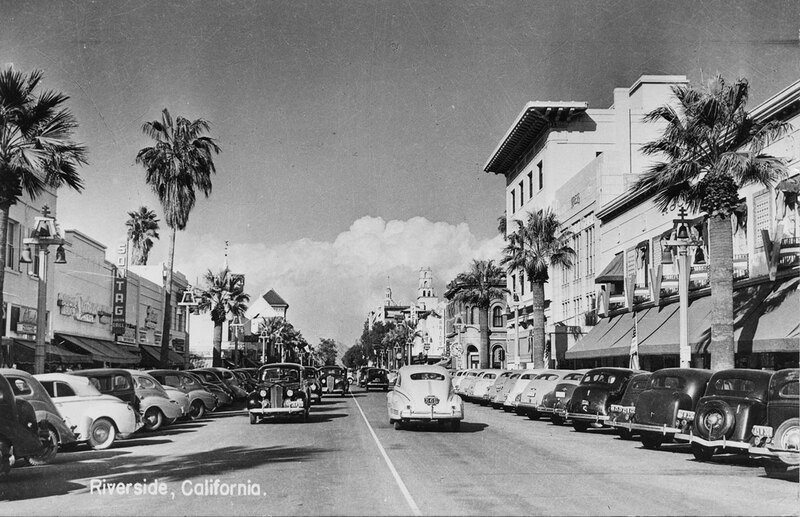 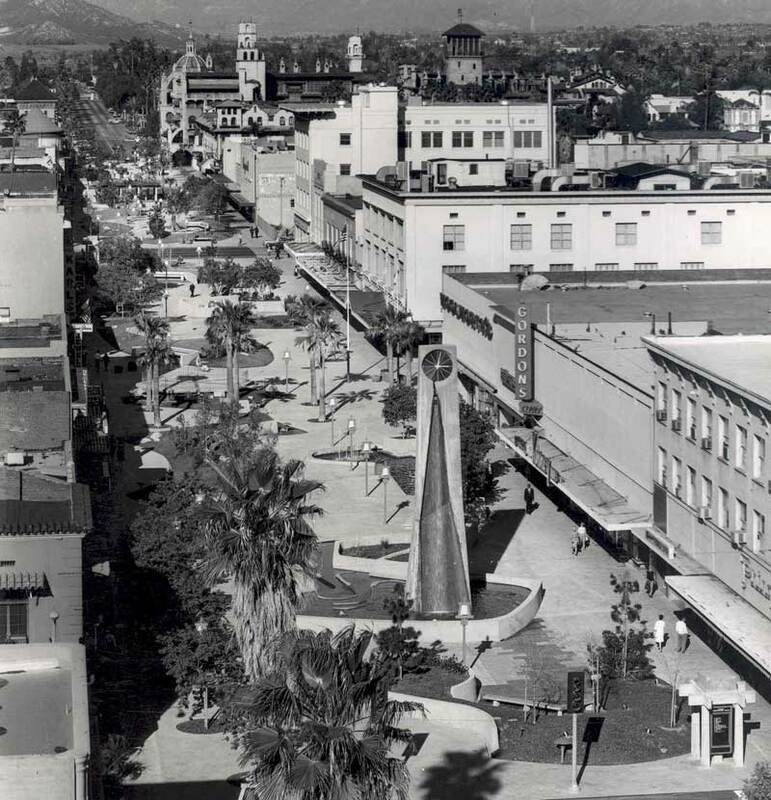 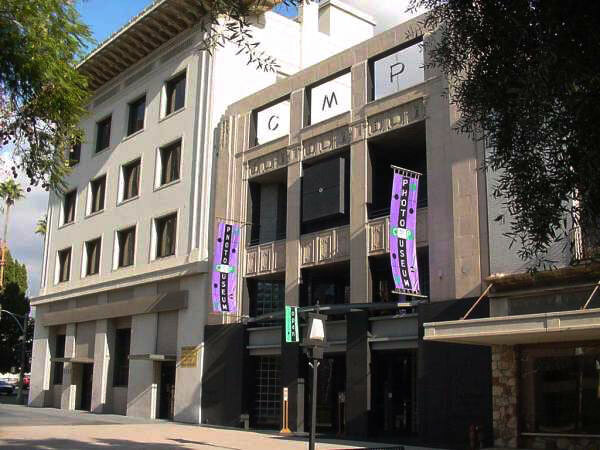 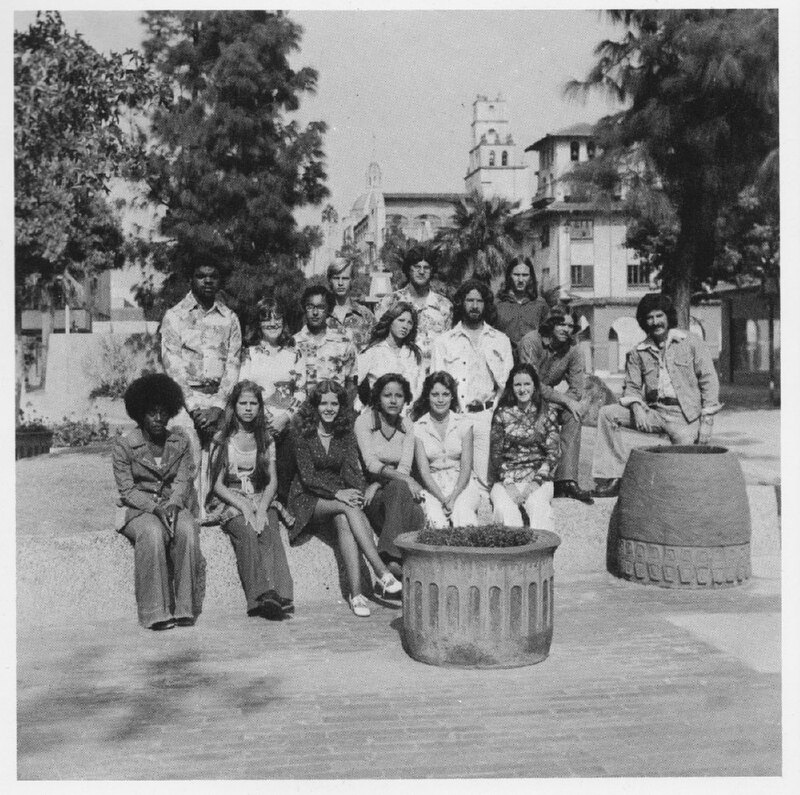 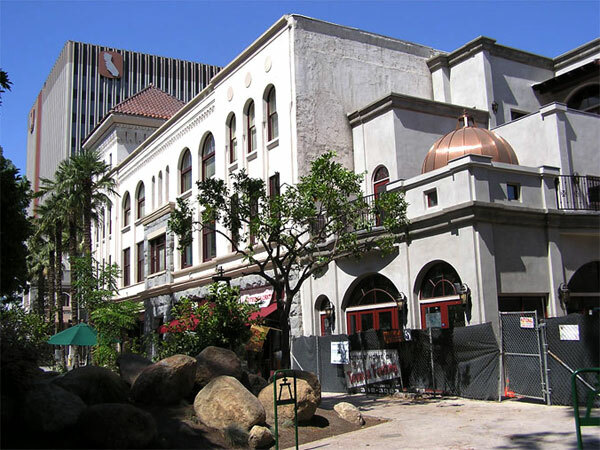 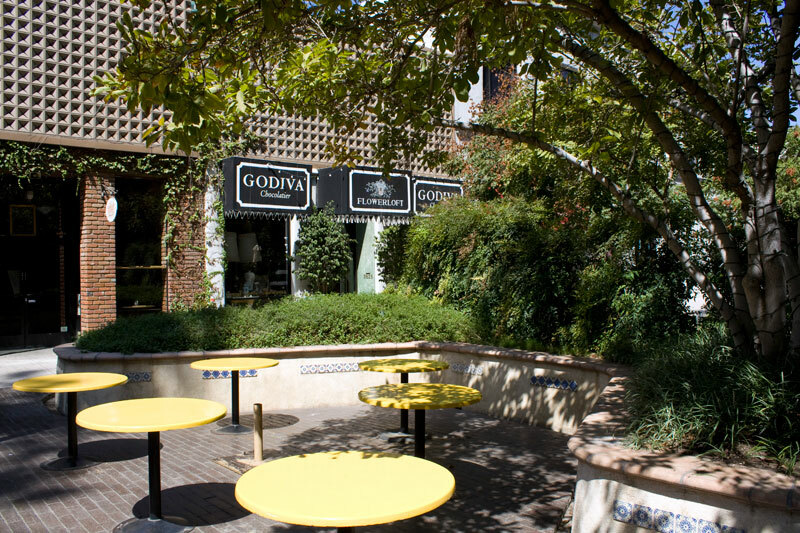 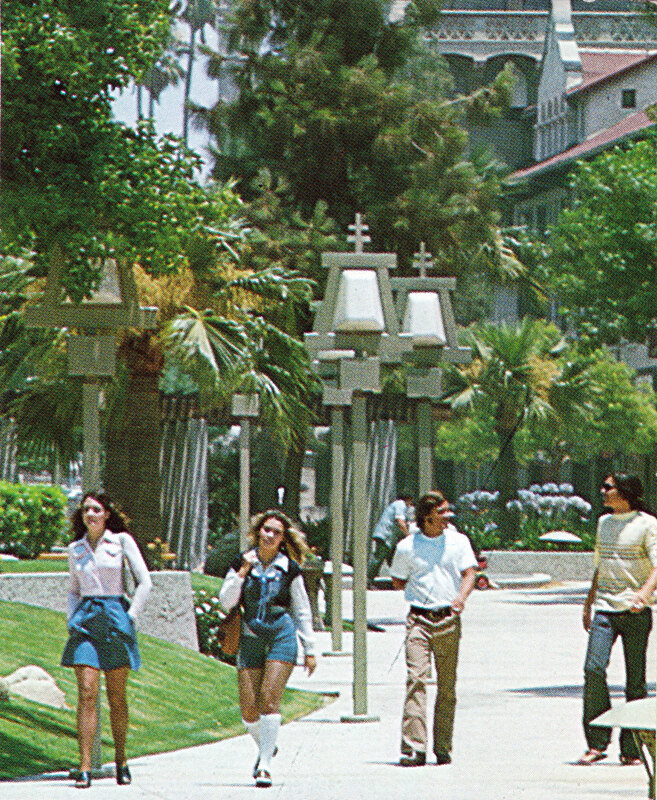 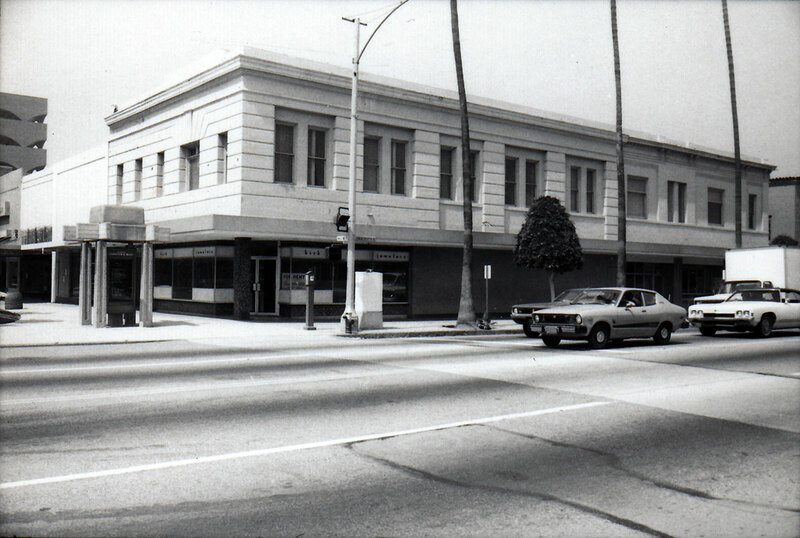 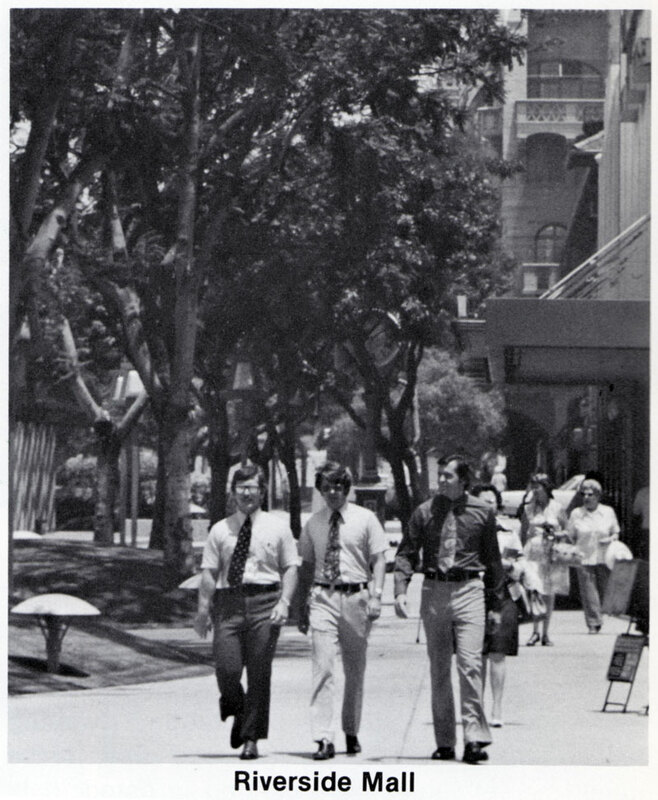 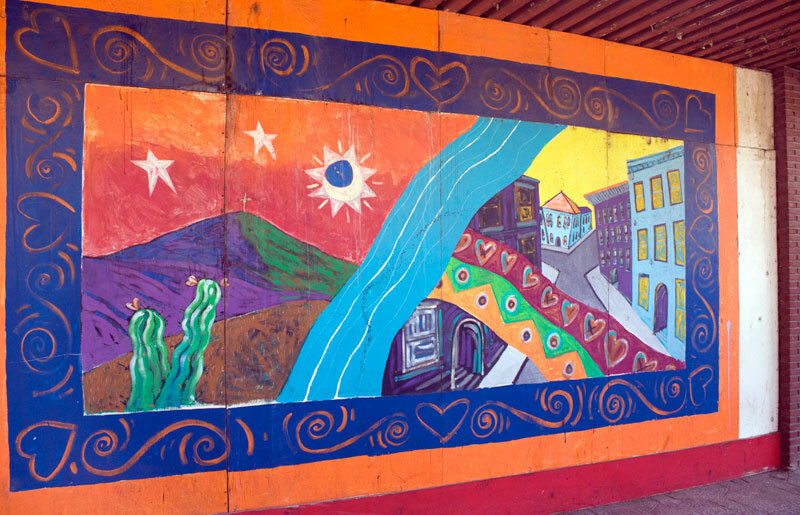 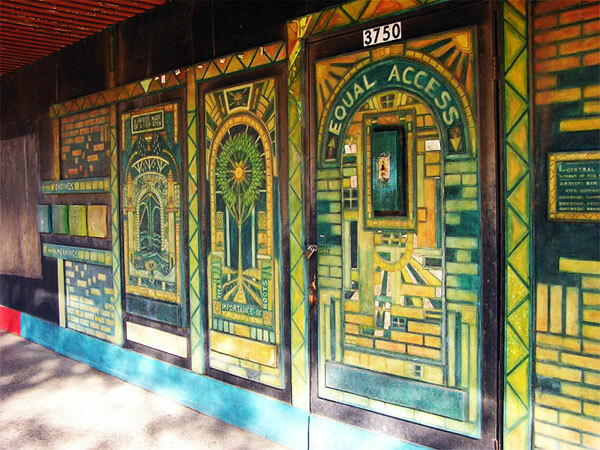 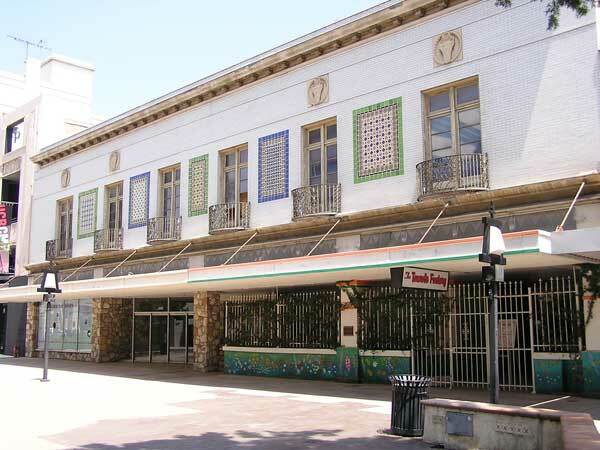 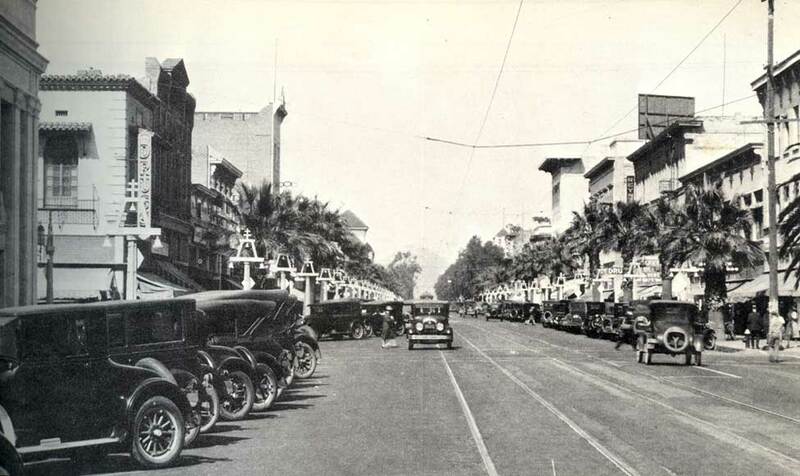 The other four east-west streets – Sixth, Seventh (now Mission Inn Avenue), Eighth (now University Avenue), and Tenth – remained open through the four-block pedestrian mall. 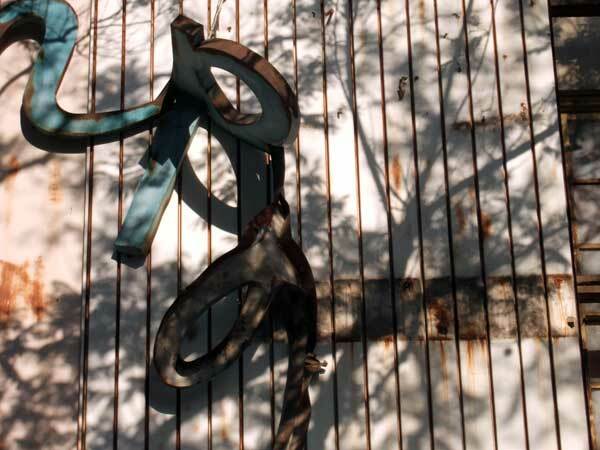 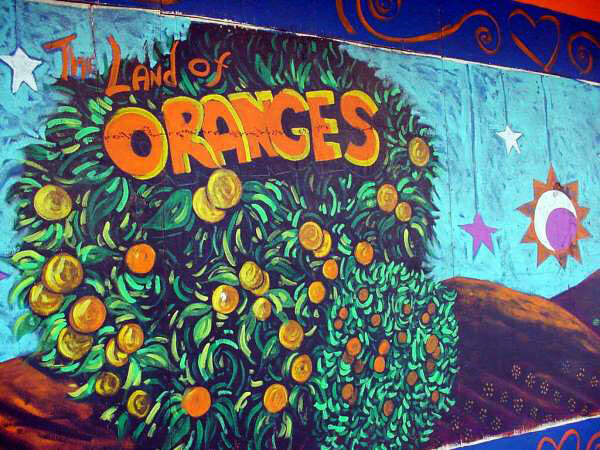 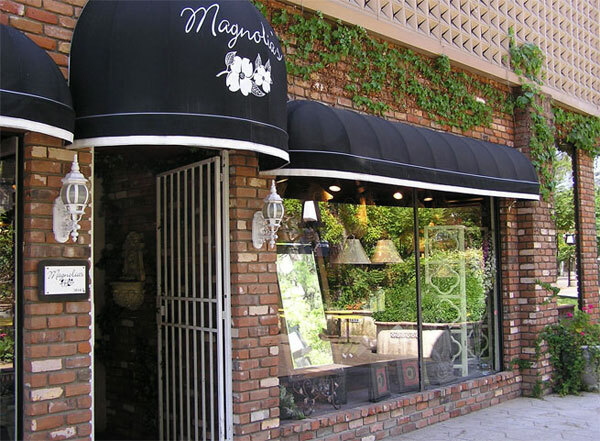 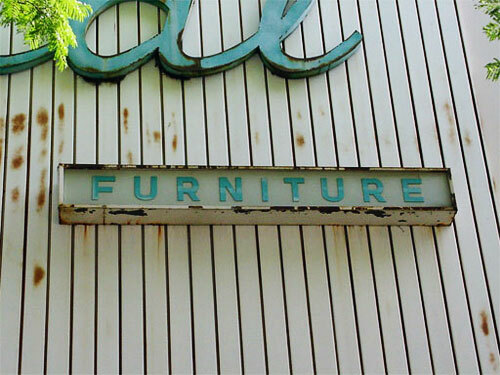 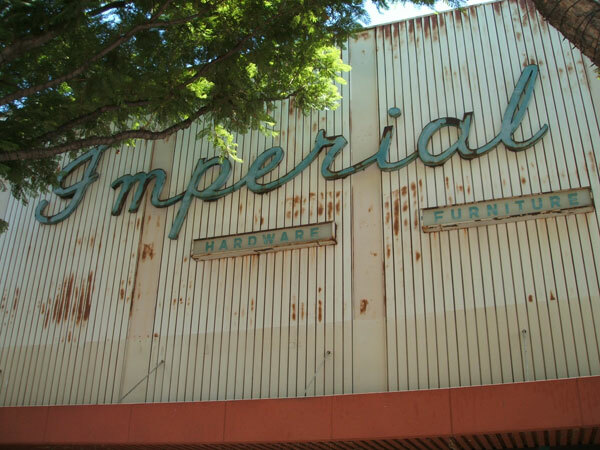 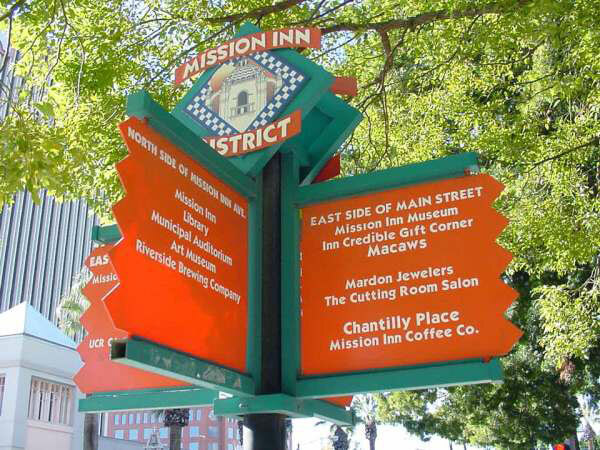 The first two decades were marked with retail defections and dwindling business, common during the suburban exodus affecting many downtowns of the era. 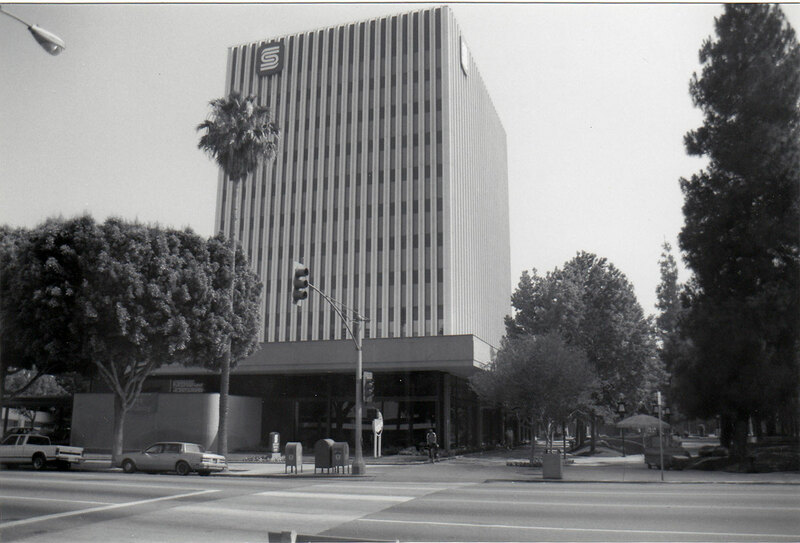 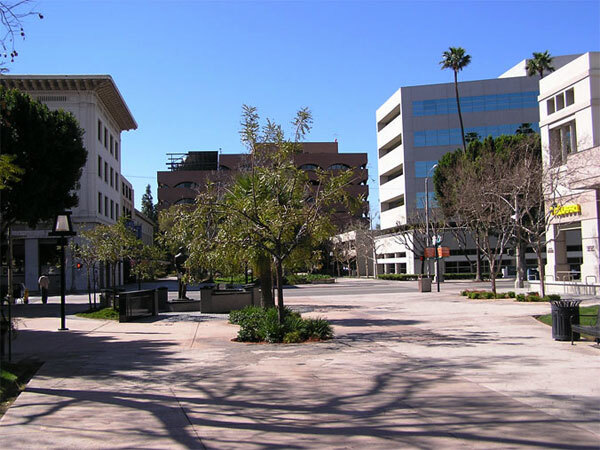 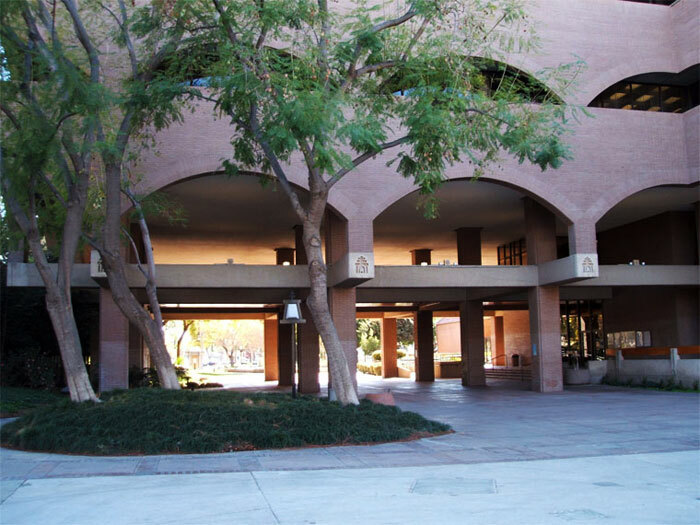 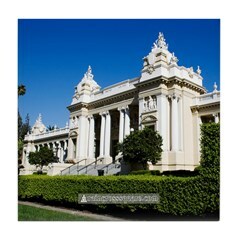 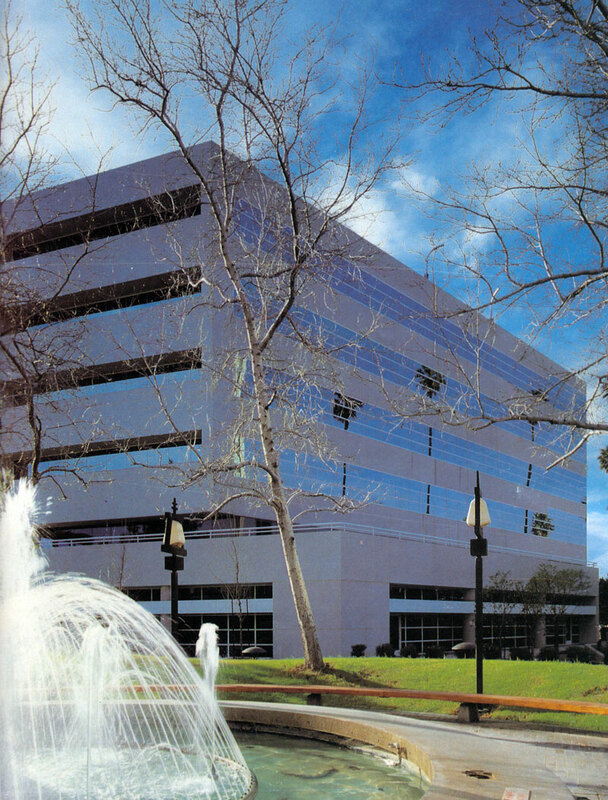 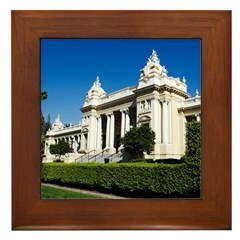 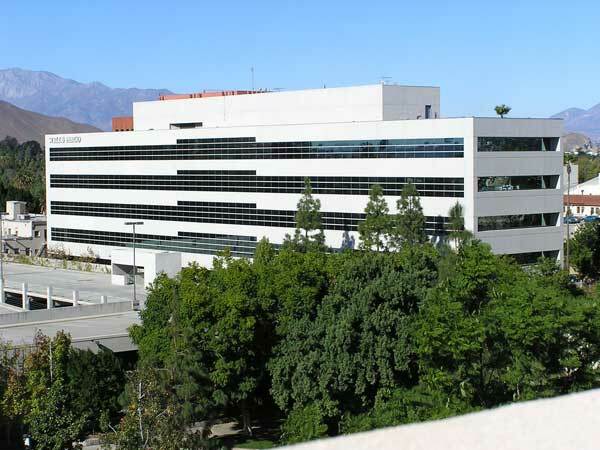 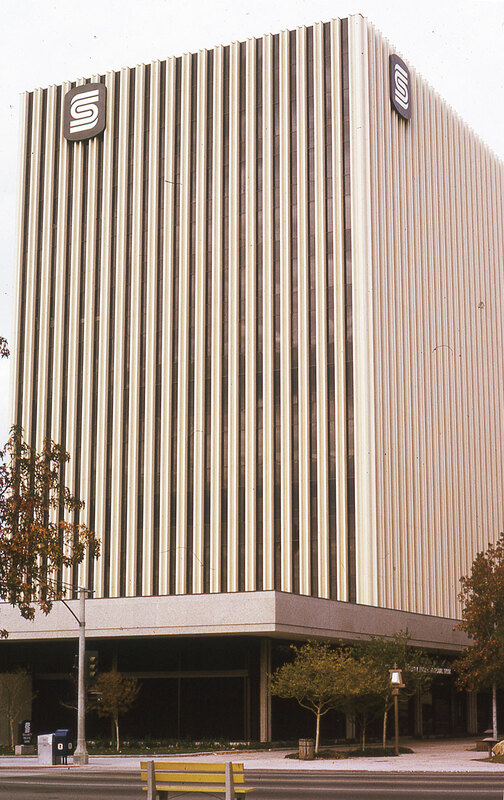 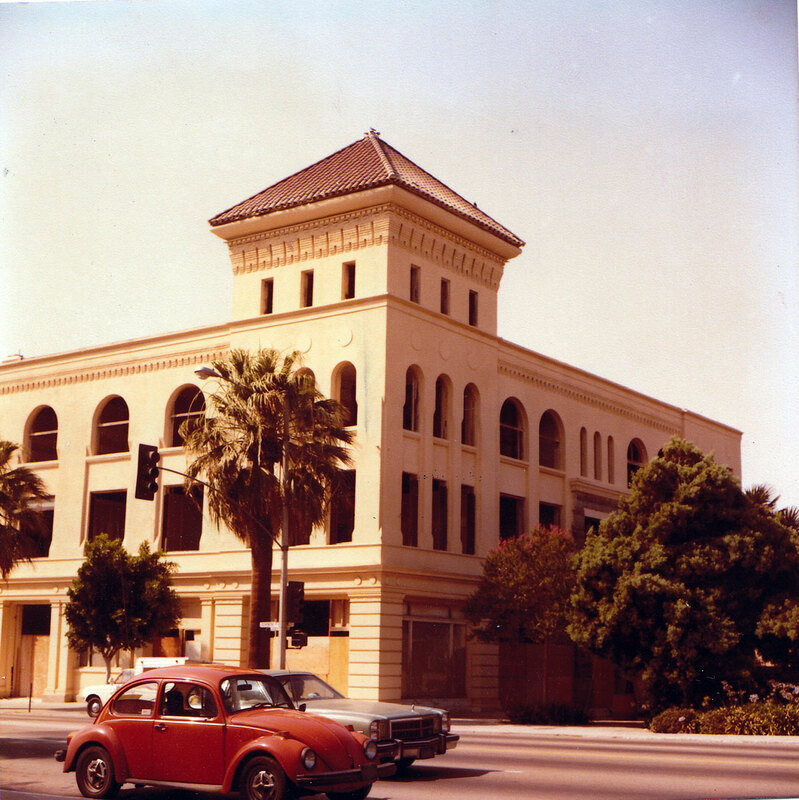 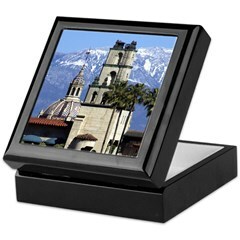 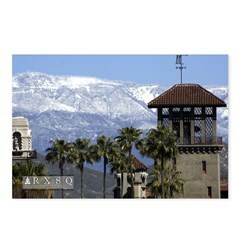 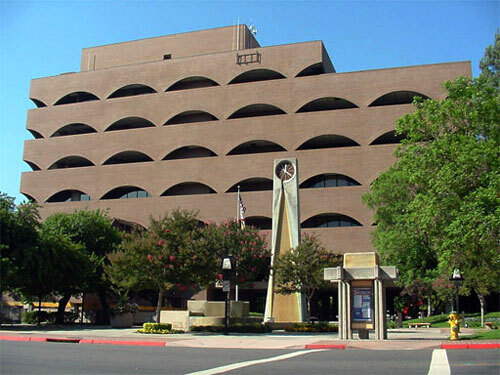 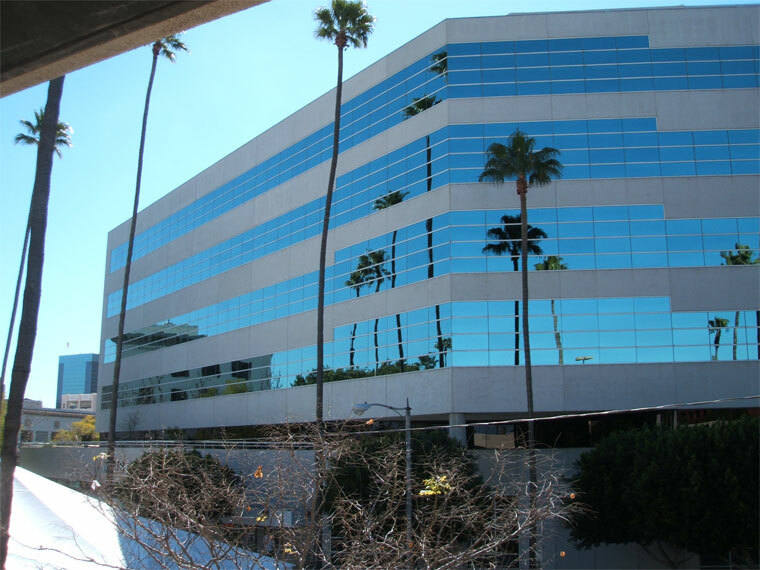 Thus, the city adjusted by adding civic uses and encouraging office development, which helped spur three office buildings: Security Pacific National Bank (1973), Riverside City Hall (1975), and Mission Square (1984). 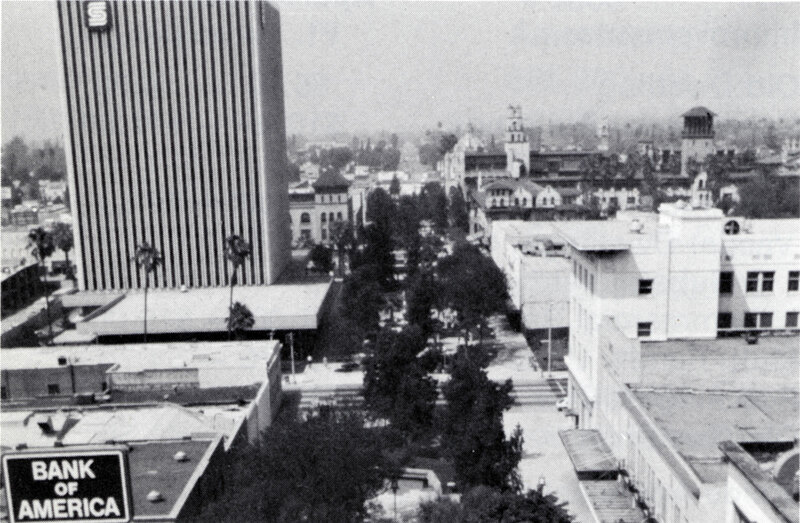 In addition, a convention center (1976) and adjacent 12-story hotel (1987) were later built one block north of the mall’s Sixth Street terminus. 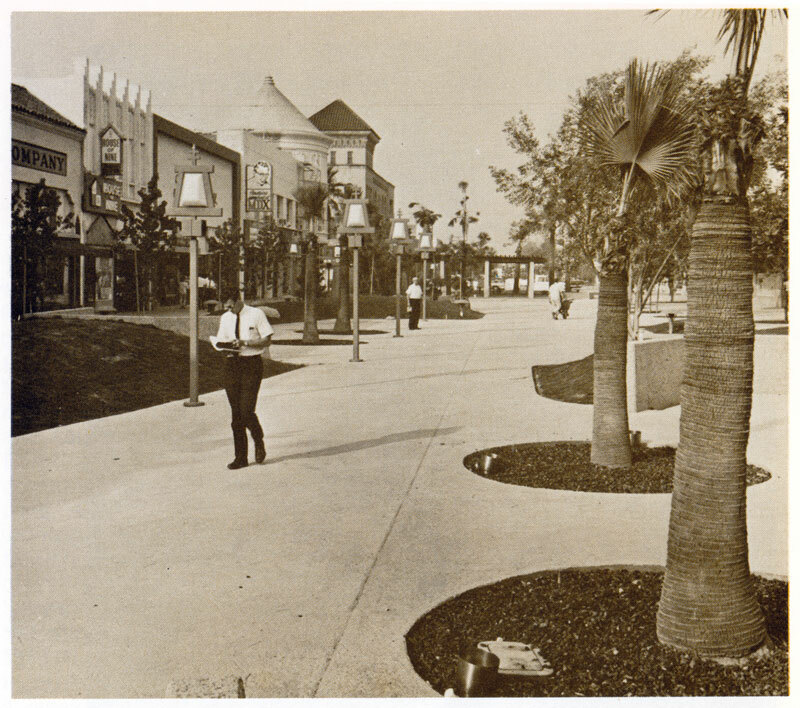 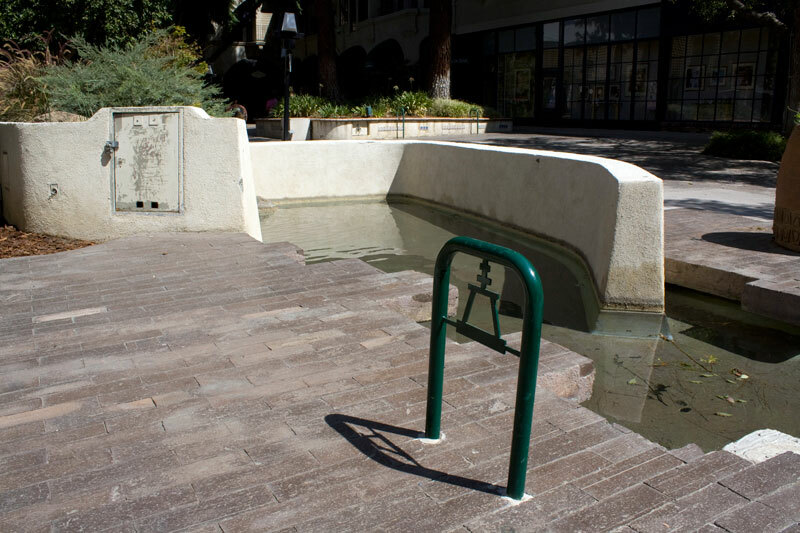 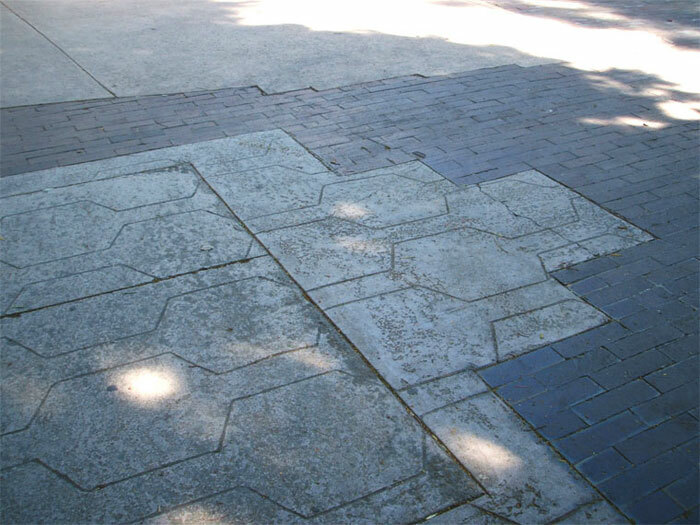 Though technically not part of the pedestrian mall, their proximity essentially made them the north-end anchors. 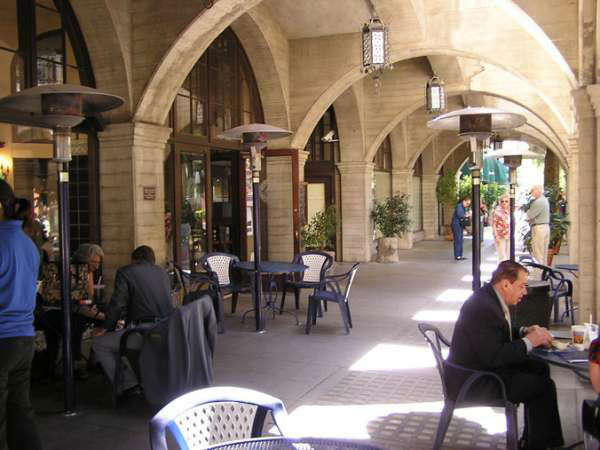 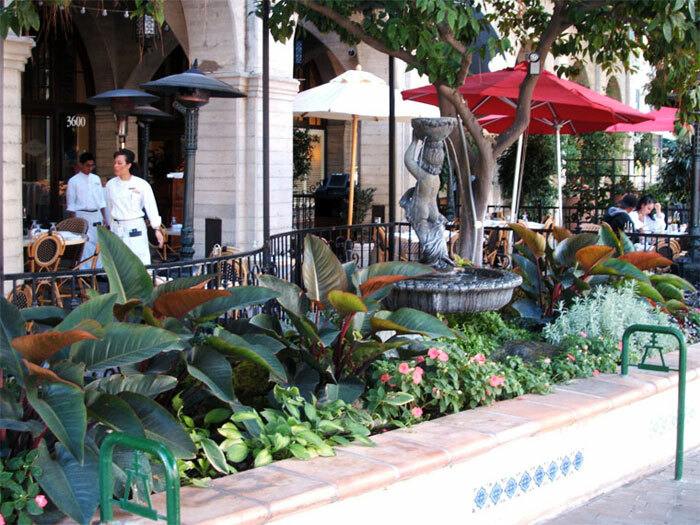 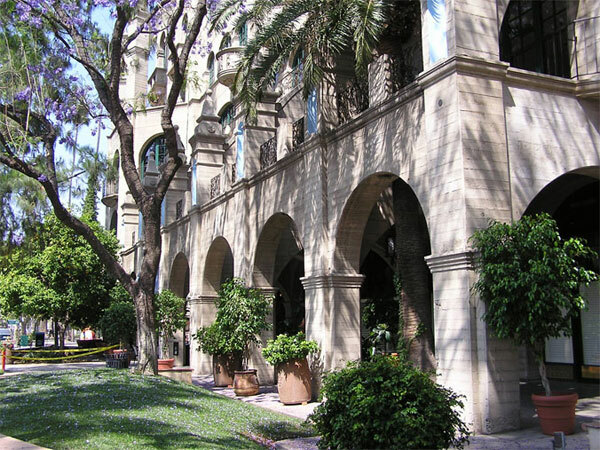 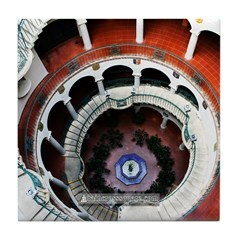 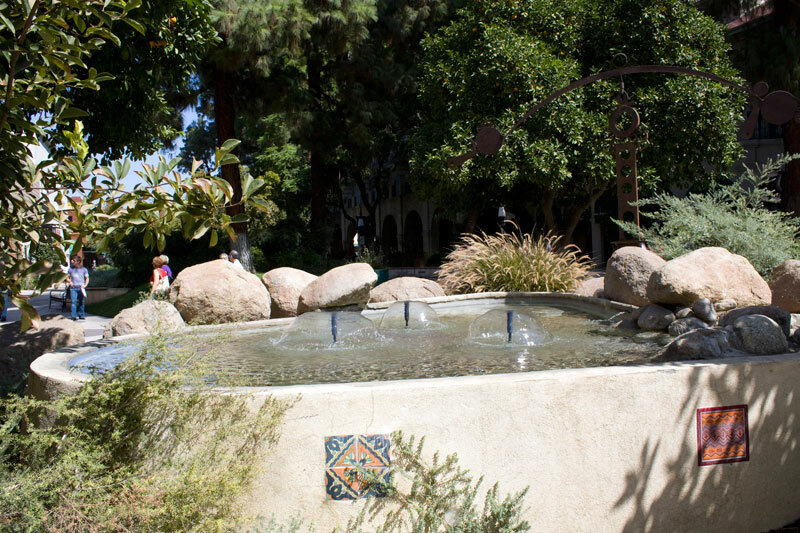 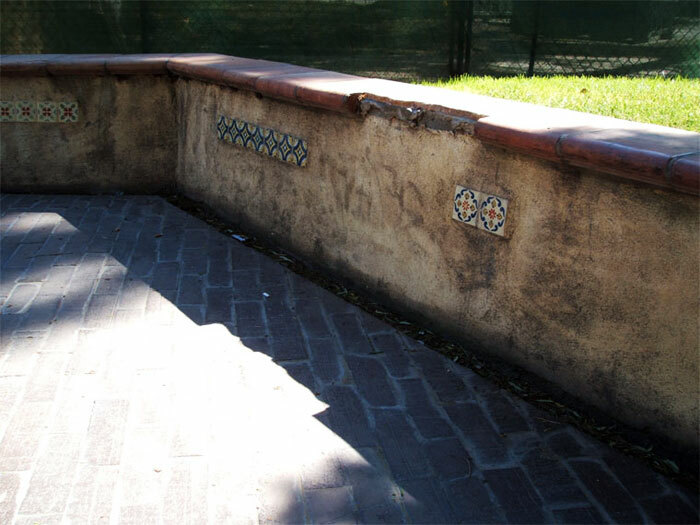 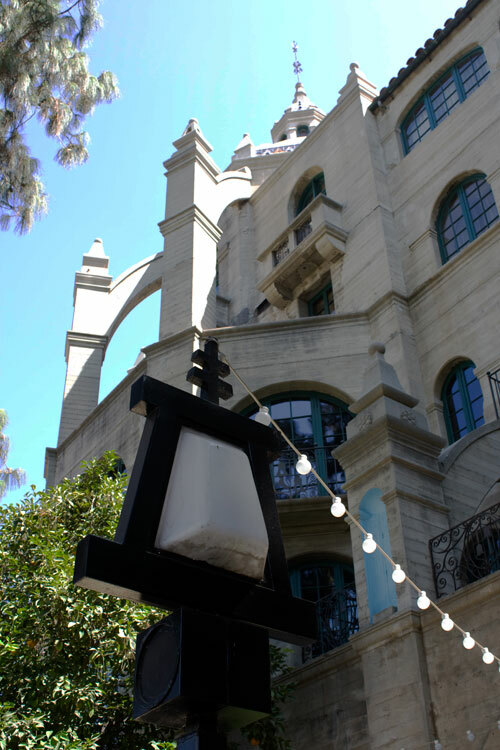 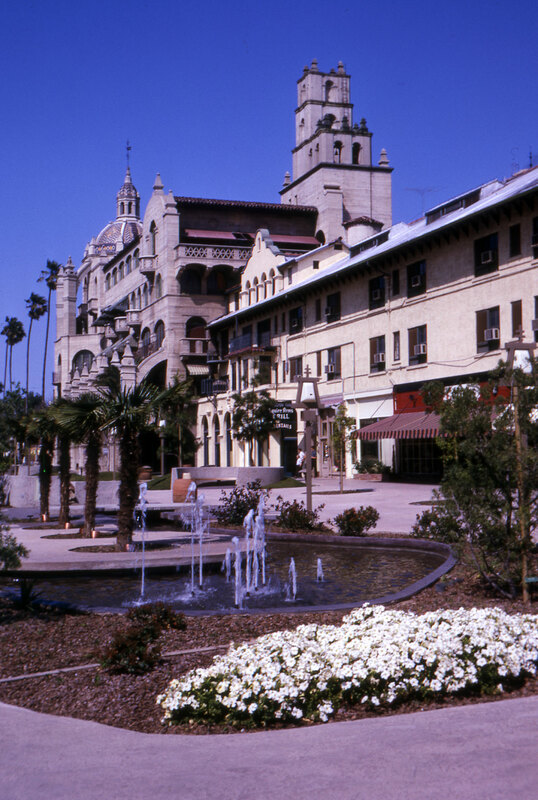 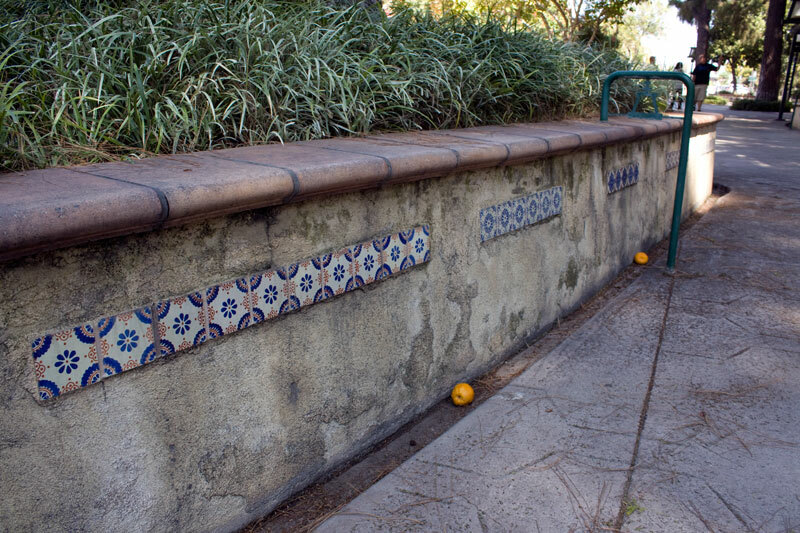 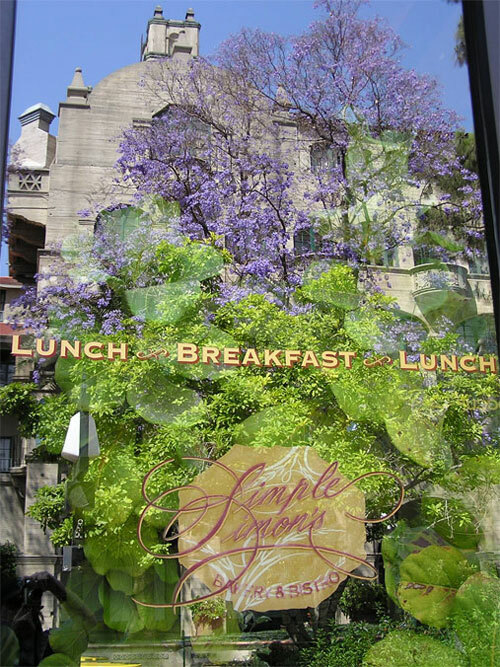 A significant boost to the pedestrian mall’s business climate was provided by the 1993 reopening of the Mission Inn hotel. 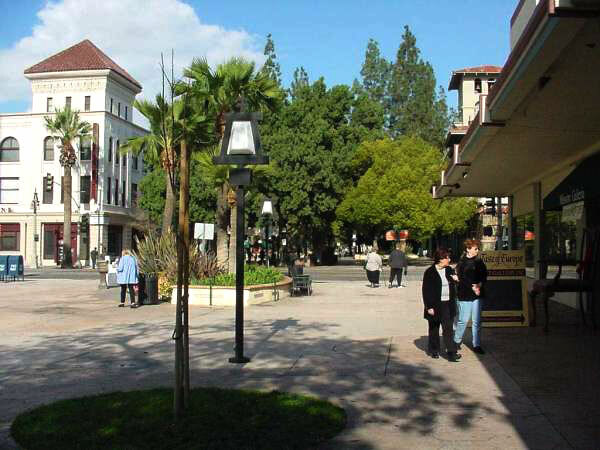 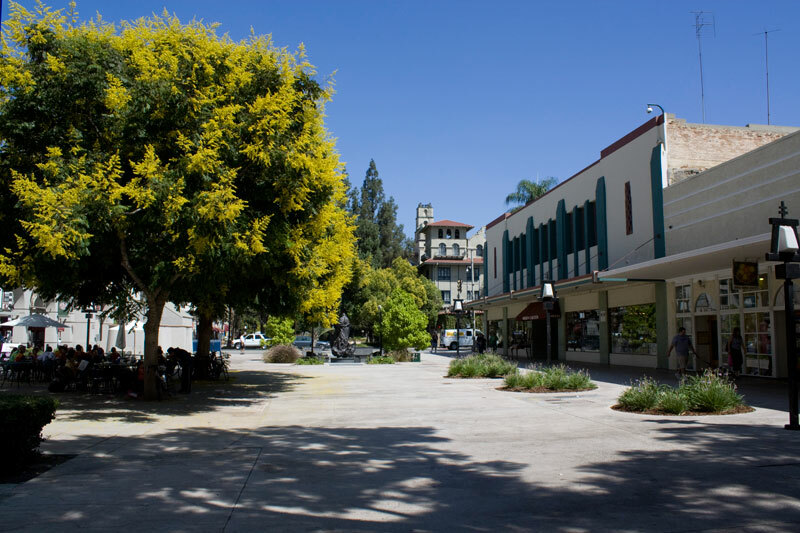 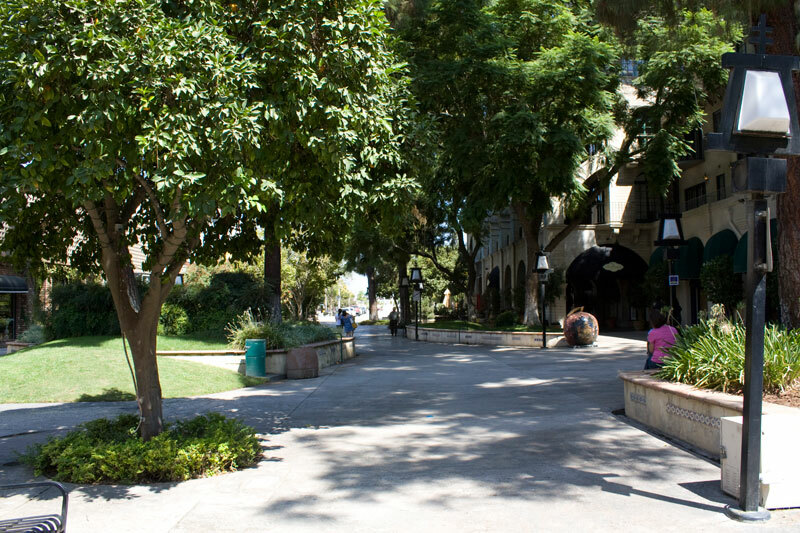 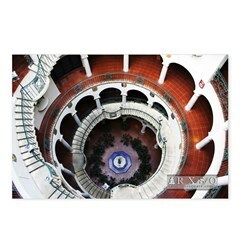 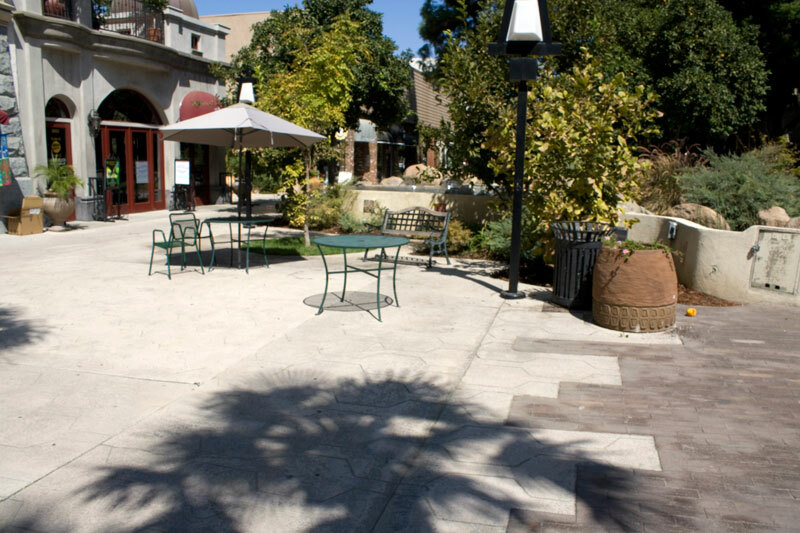 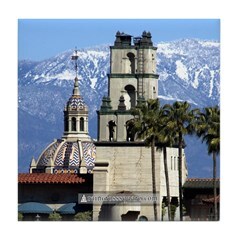 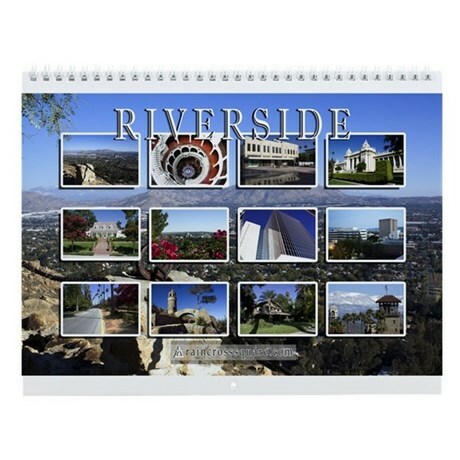 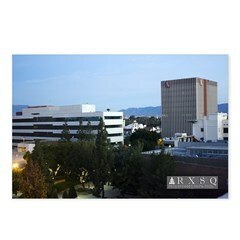 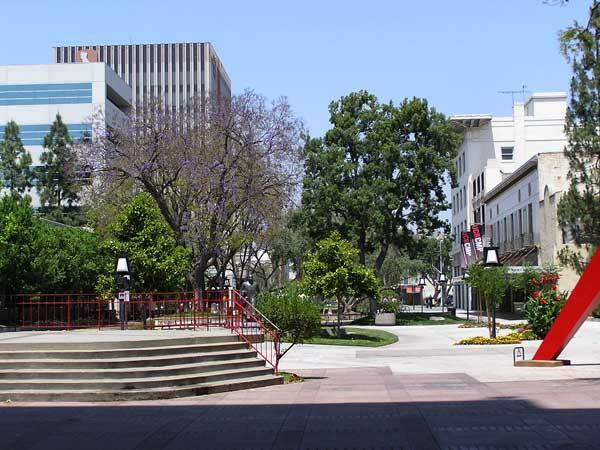 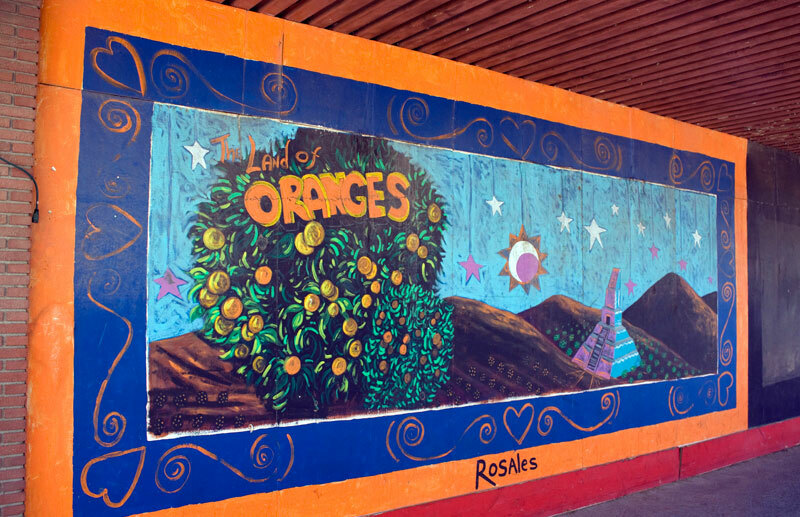 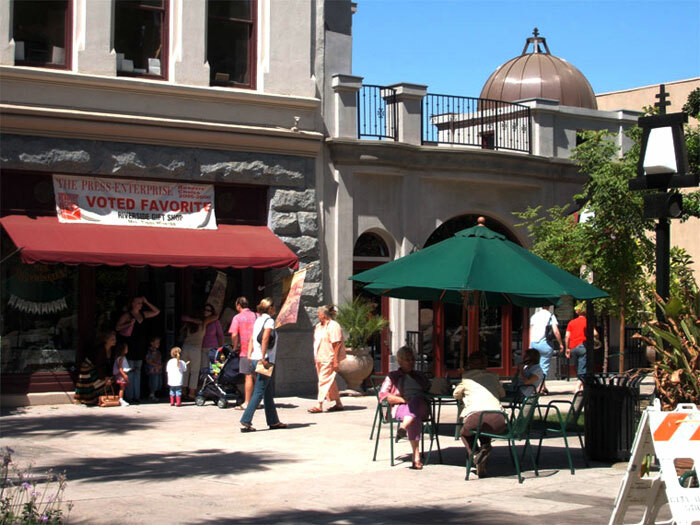 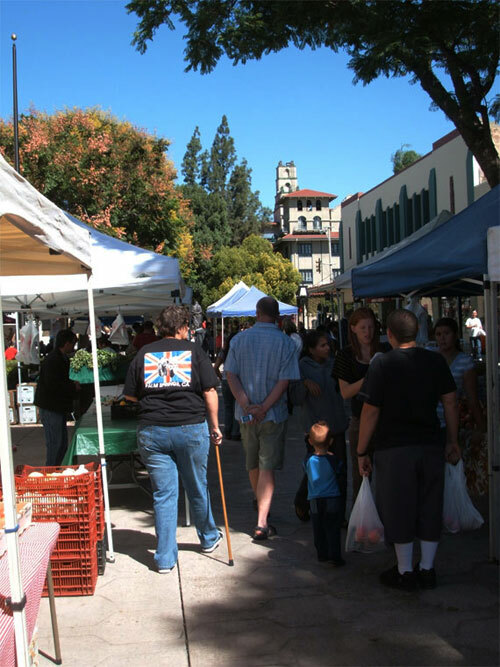 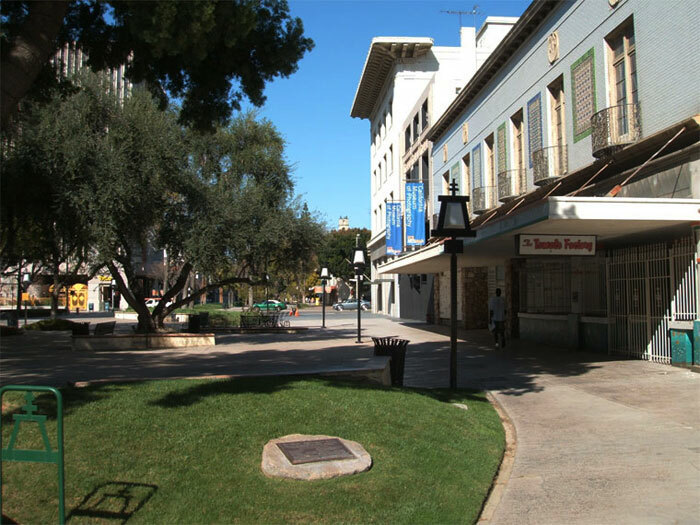 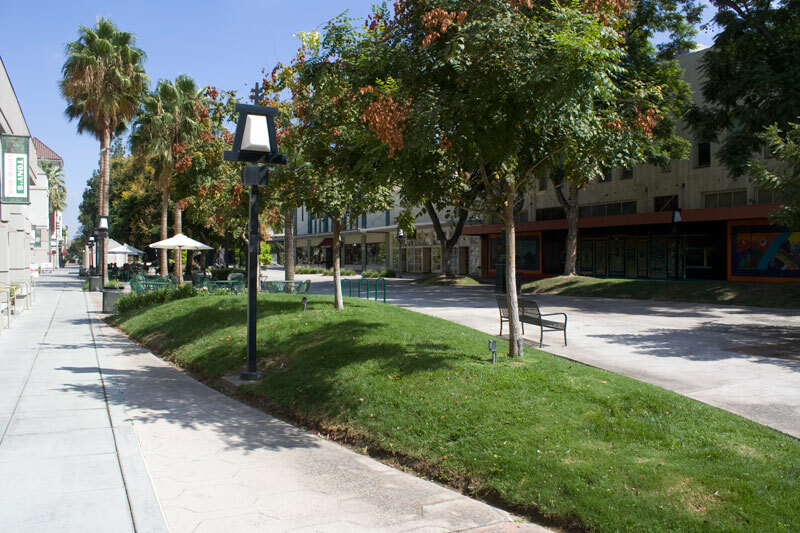 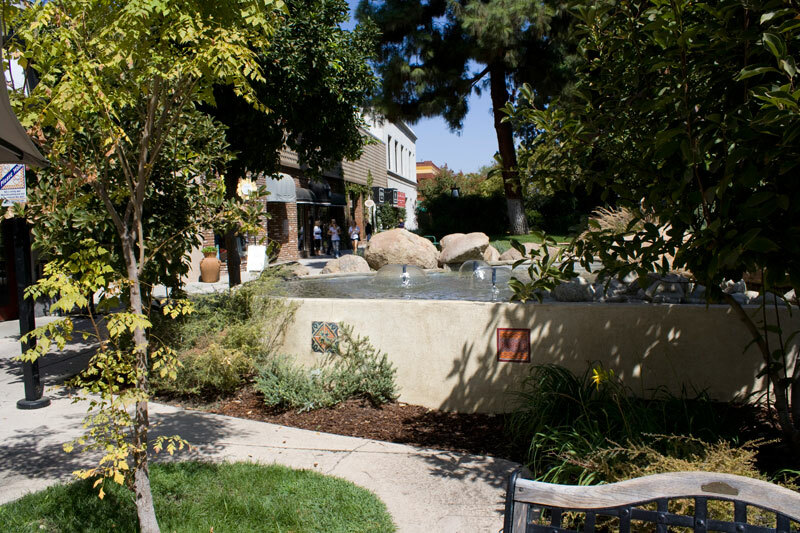 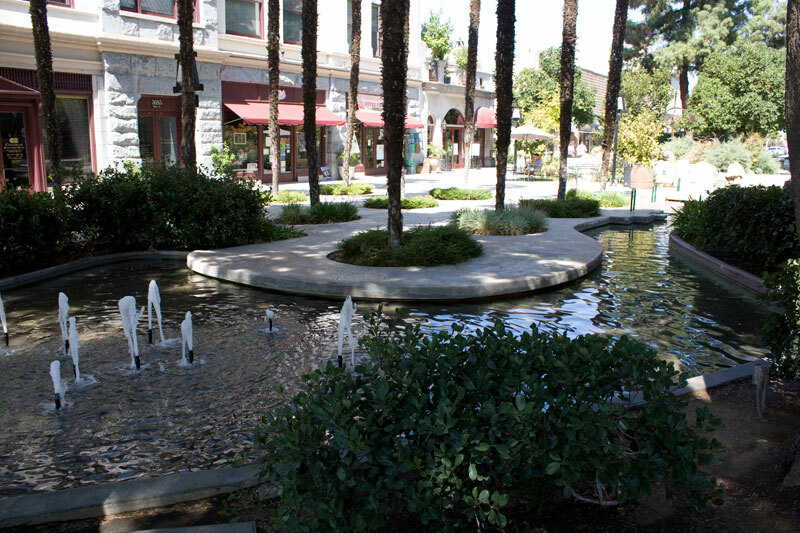 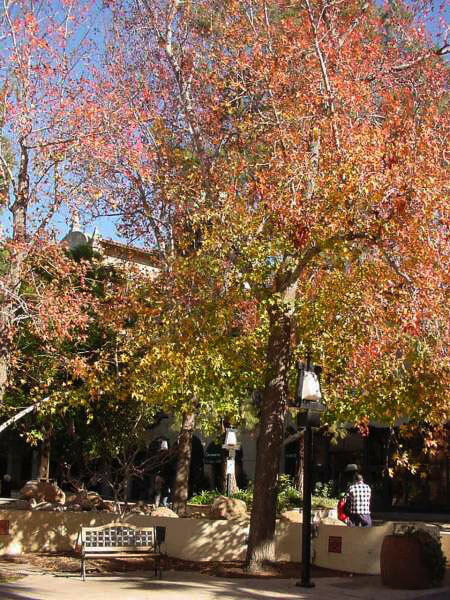 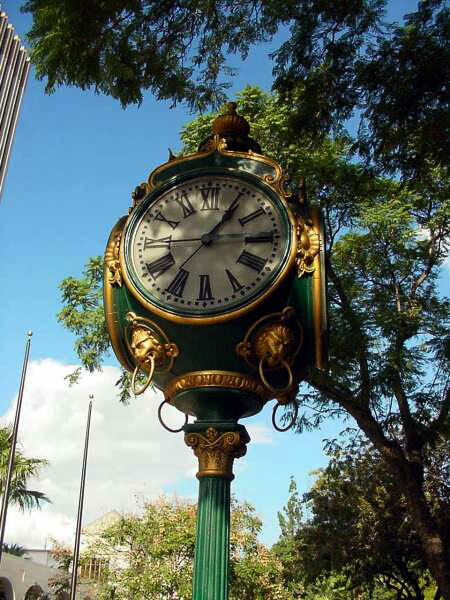 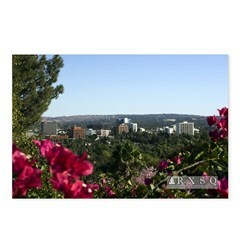 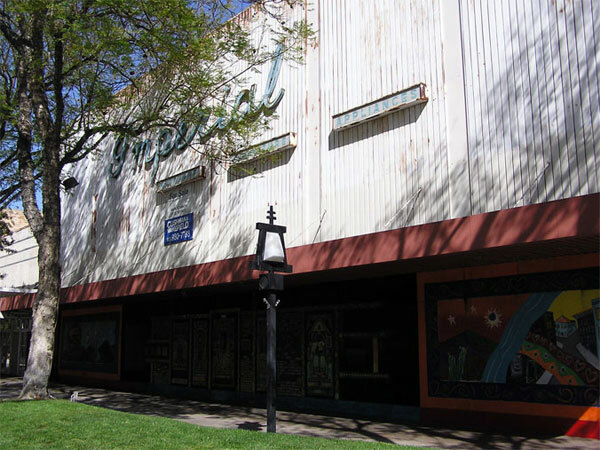 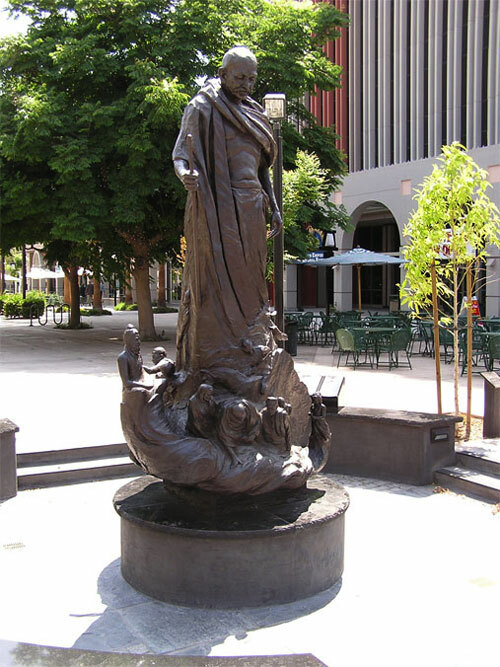 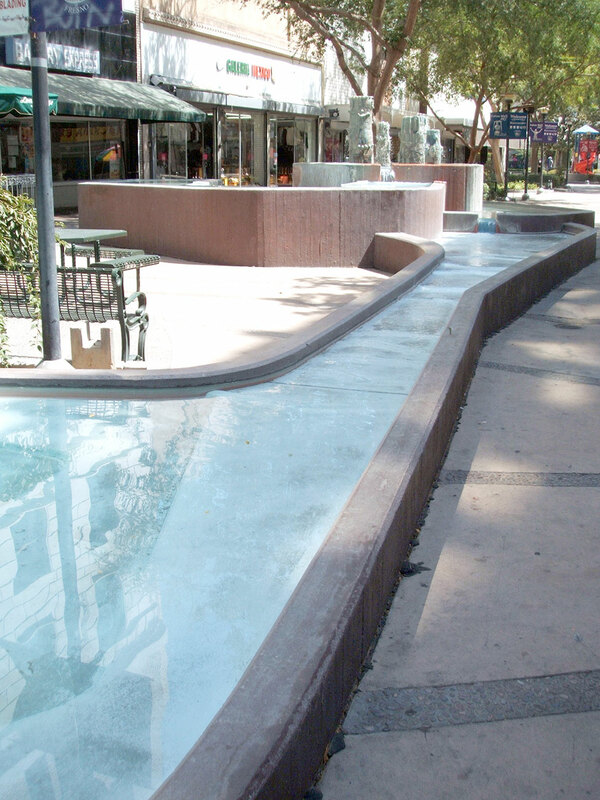 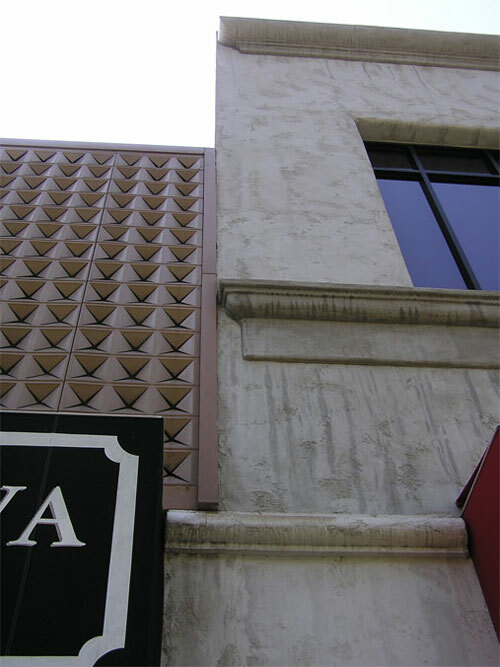 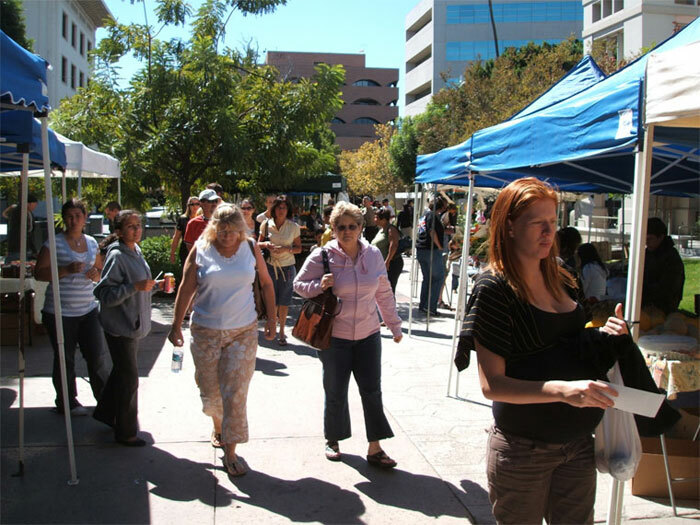 And since 2000, the mall has steadily grown in popularity and indeed is considered a unique part of downtown Riverside. 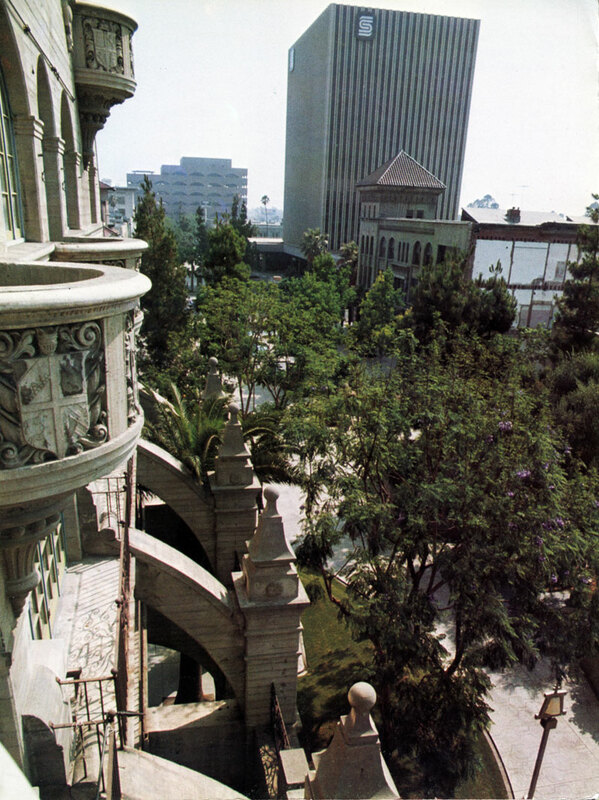 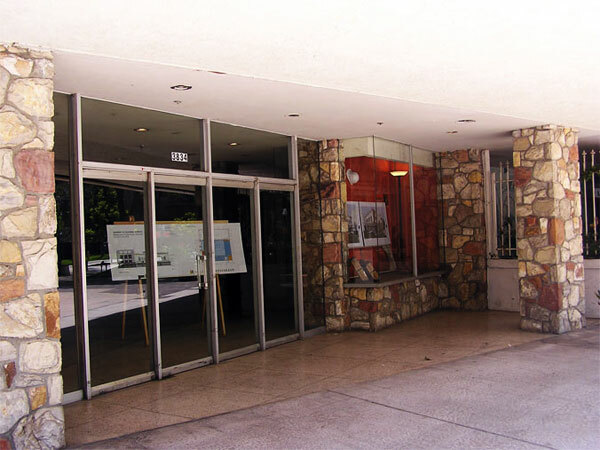 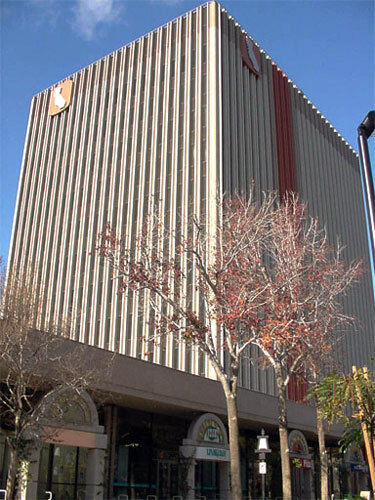 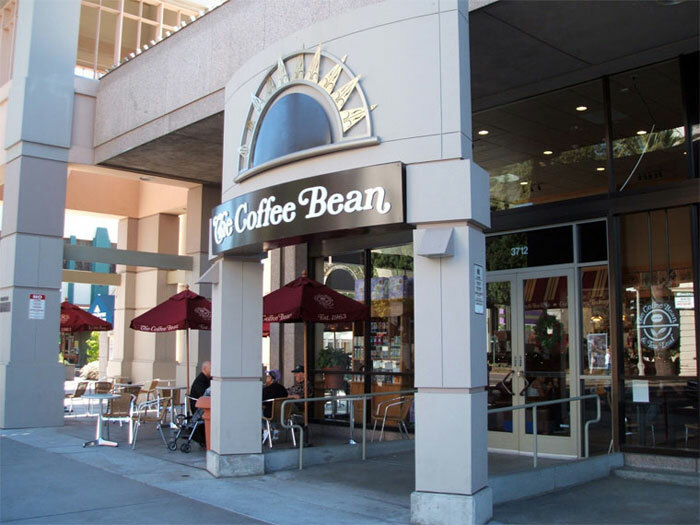 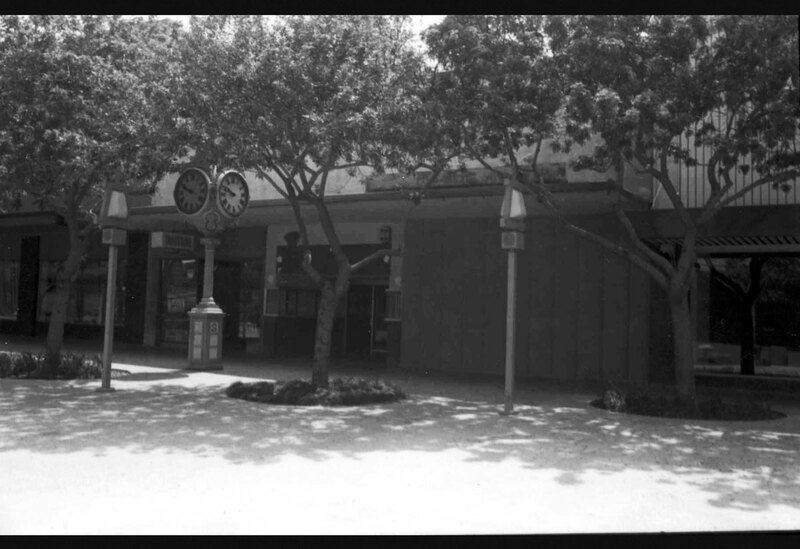 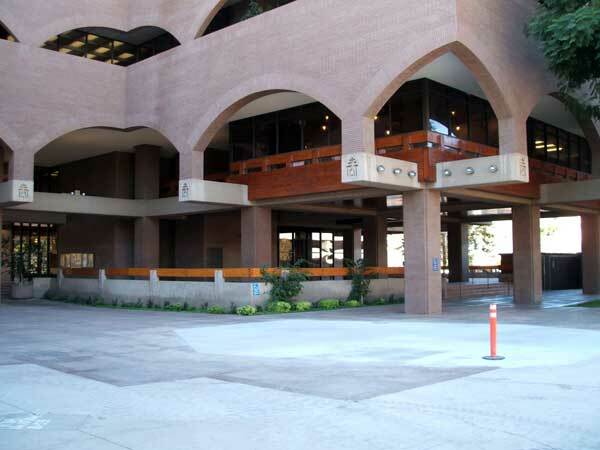 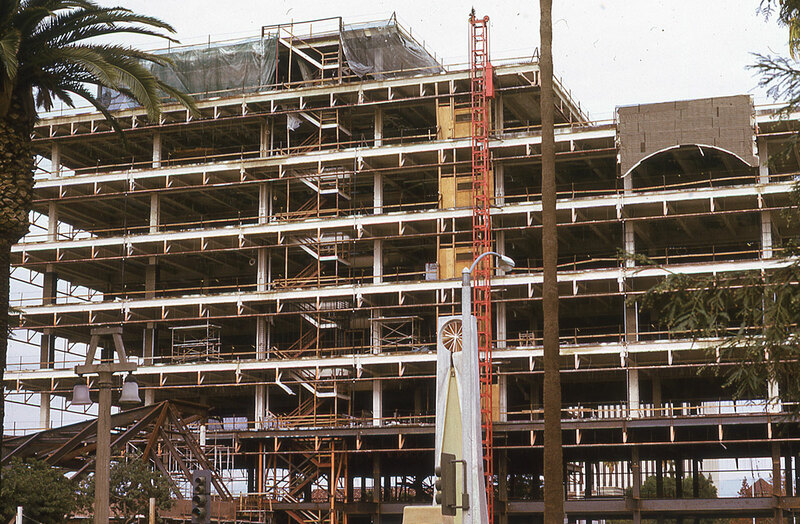 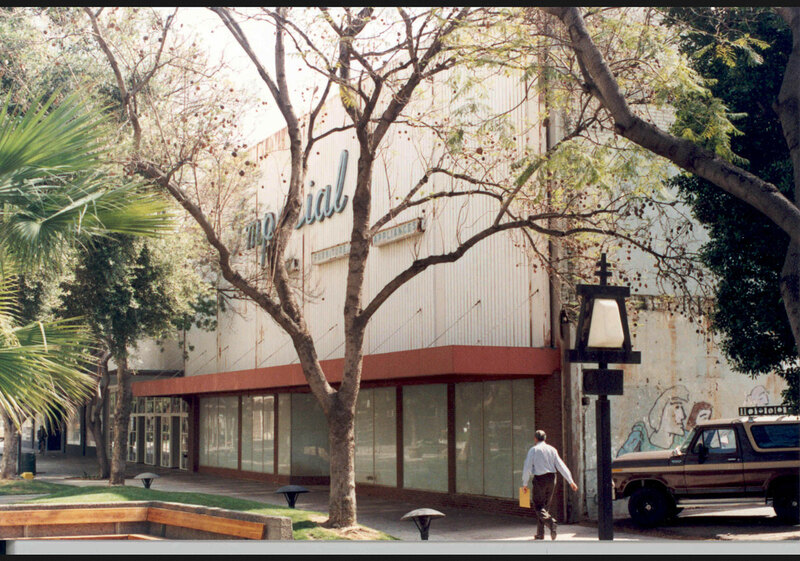 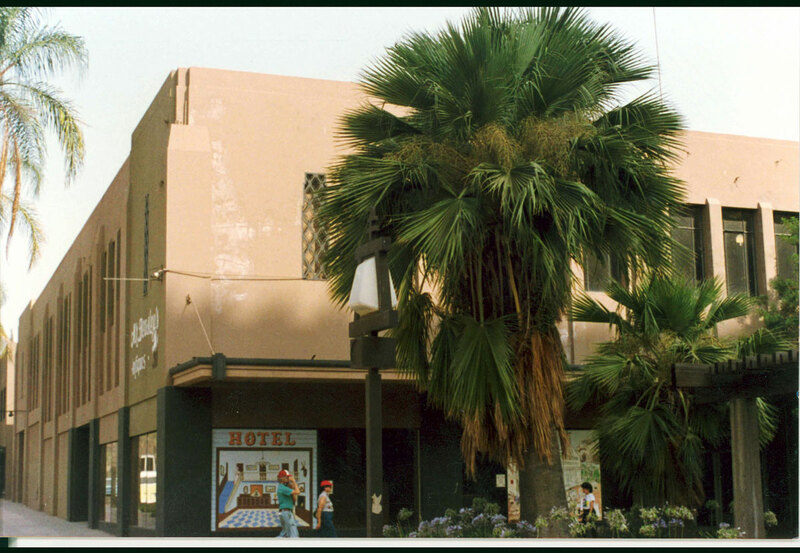 Excepting the construction of City Hall and the repurposing of the Security Pacific bank building into the California Tower (mid-1990s) – both of which made significant changes to some of the original mall designs – the pedestrian mall received only modest updates. 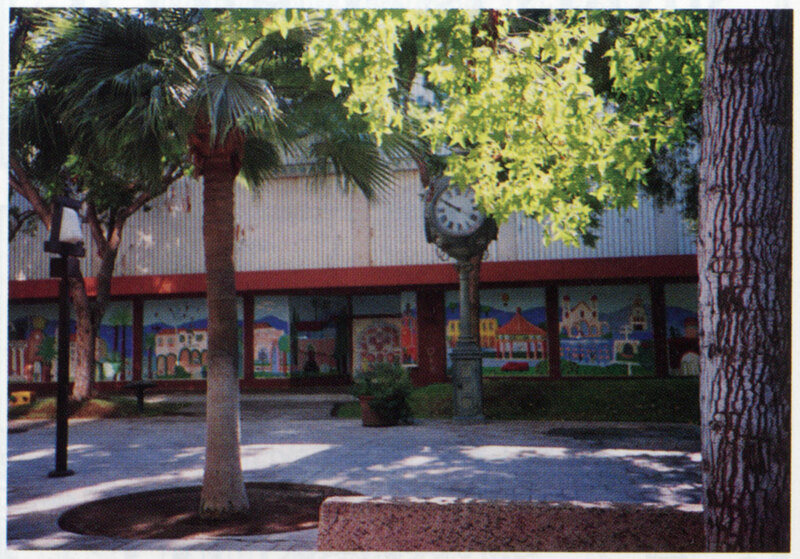 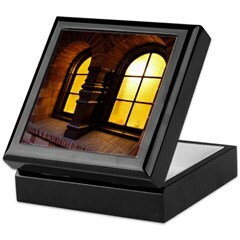 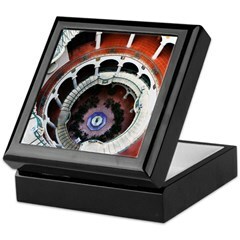 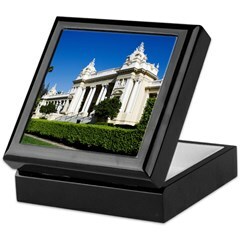 This changed in March 2008, when an extensive, year-long modernization and makeover began. 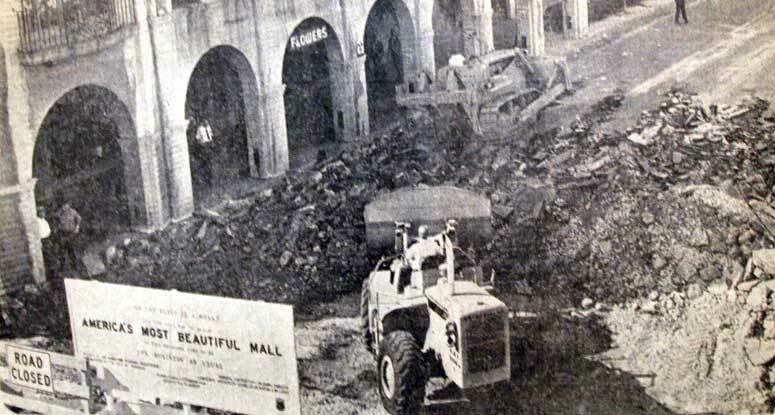 As part of the update, Ninth Street was reopened through the refurbished mall. 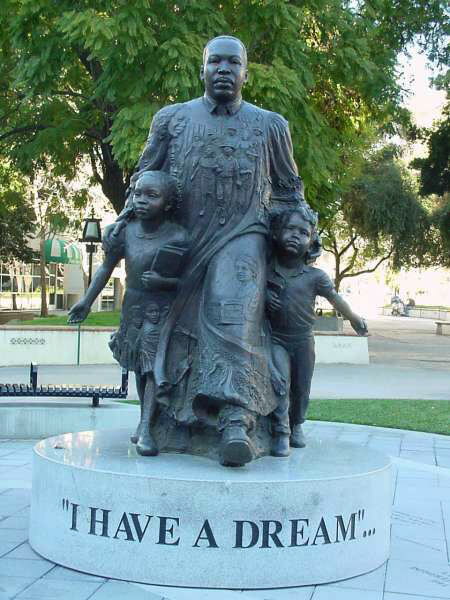 2001 – Martin Luther King Jr.